Happy Birthday to Lynelle, Lynette, and to my sister Sandy! FYI: Sometimes I’ll need to post the text first and then upload photos later since the uploading takes a long time so please check again for more photos that get posted. You can double-click on the photo to enlarge the photo if you want to see more detail. 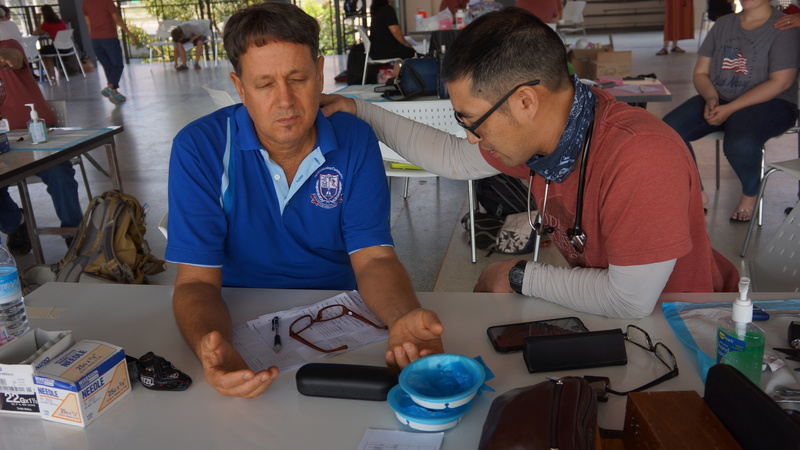 Thanks for reading and we appreciated your prayers for those who we serve so that they can appreciate God’s glory and for the medical team’s safety, physical and mental health. Last night was interesting. The lights in the hotel flickered momentarily and we looked outside wondering if there was a blackout in the city like in 2017. We looked down the hallway and it appeared that smoke was bellowing out of Bill and Gail’s room. Oh no, some thought a fire, but no fire alarm. The “smoke” was steam. Bill was using the sterilizer and overloaded the circuits and his room lost power. Bill was exasperated. So Bill said he had nothing better to do during the repair so he got out his lantern and computer and finally got around to reading my blog that he assigned me to write but hadn’t read. I’m glad to help you with your boredom Bill I knew that the pressure was mounting and Bill would eventually blow his fuse. 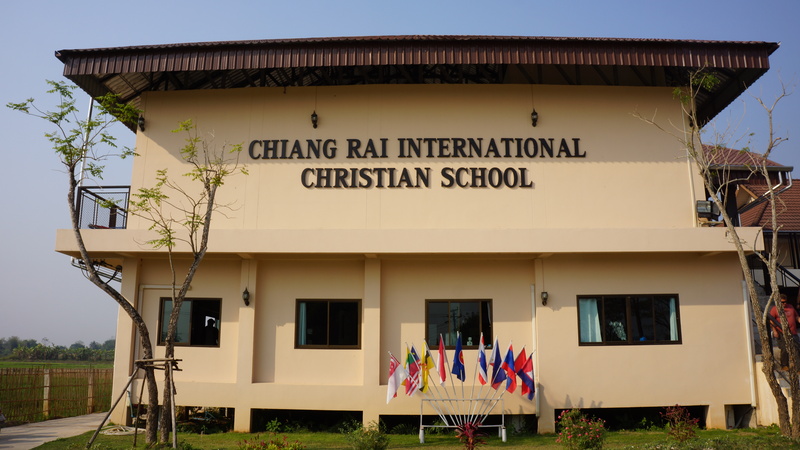 Today we traveled to the Chiang Rai International Christian School (www.crics.asia) where three of the youngest children of Ghan and Luka go to school. 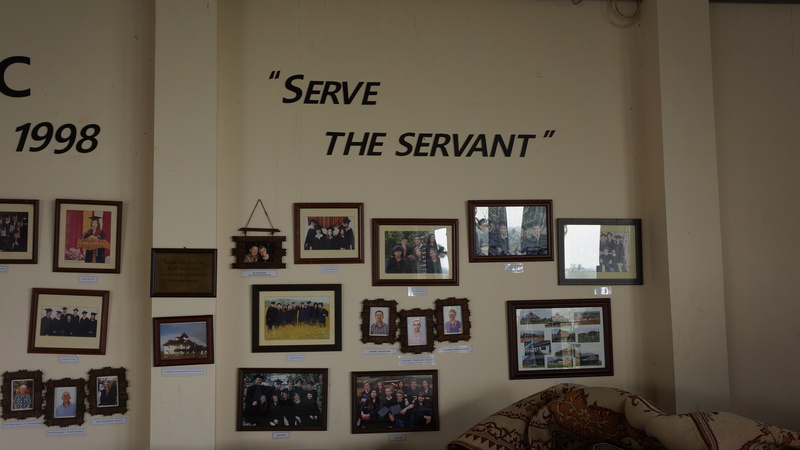 The school’s motto is “Serve the servant” by helping support missionaries and servants to live in Thailand. 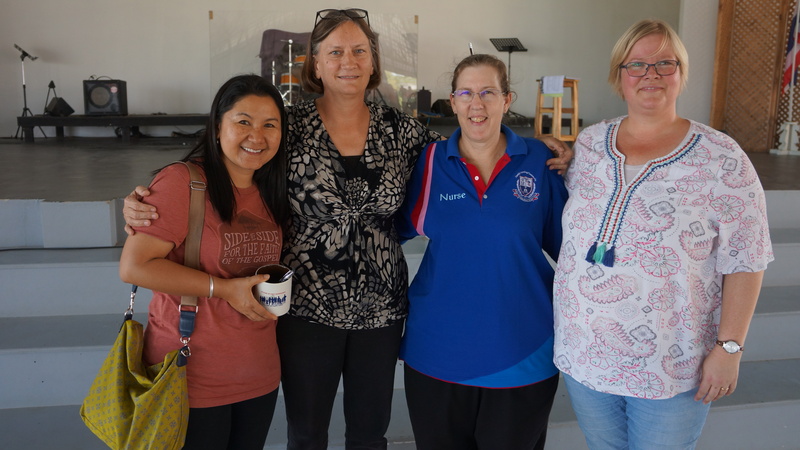 The staff is comprised of these volunteer missionary teachers from around the world. There are 207 students with a 60:40 female:male ratio. The student population includes missionaries’ children and others from Buddhist families who recognize the quality of the education for their children. 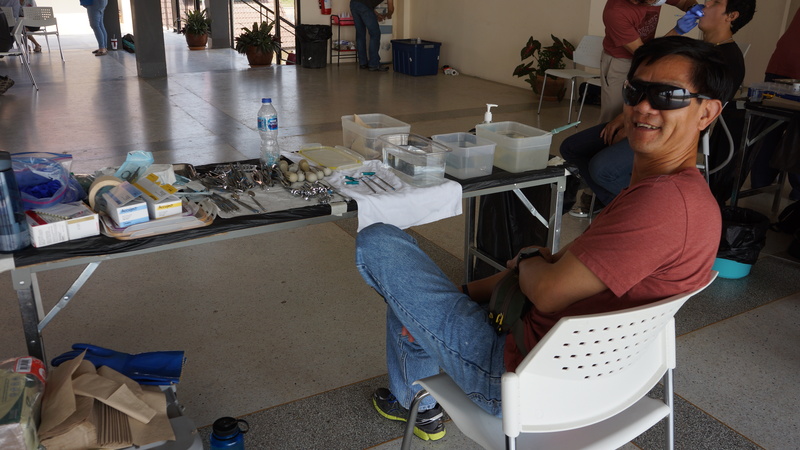 Most of the patients we saw today were of the volunteer staff as well as a few students who wanted wellness examinations. 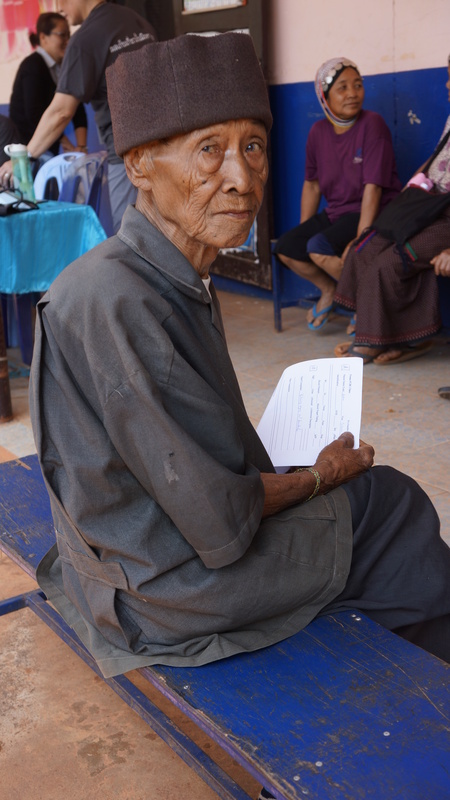 But these examinations allowed us to interact with some particular patients who just wanted to be heard. Their hearts may have been hurting more than their bodies’ ailments and this gave them an opportunity to speak to those who would listen. I saw a patient for a wellness exam who had no complaint but when I asked, “Anything else?” as I was getting ready to release her, she responded, “Oh, I was treated for depression.” After digging and prying her history of depression for most of her life I found that she was off her medications after trying about 6 different ones and had suicidal thoughts but responded, “I cry all the time but I would never go through with it.” I enlisted Chris Chow to talk over alternatives for treatment and advised her to go to the hospital and get back on her meds and she agreed to go seek treatment. We, as health professionals, feel we need to fix something but the fact that we spent more time listening than doing was more valuable than actually offering them medical advice. It allows us to reevaluate what is actually a success or treatment failure in our ability to use our skills. Though we think we are missing our tools at the airport to effectively treat the patient, God is using us, as individuals, as His tools to help them feel peace, comfort, and the love of God. Our measure of success and purpose is not always God’s measure and He sets the standard. Lena was sharing that she saw a mentally challenged 23 year-old yesterday at the Akha village, that looked twelve who showed up to the clinic alone making no eye contact. She was scared clutching her arms to her chest. Lena just wanted to go up and hug her but just put two hands on her shoulders. She was thinking, “Do you know that there is a God that loves you and that you are never alone? God is always with you and loves you.” That goes for all of us. There is a point, a lesson for me with this next story so please bear with me or just skip it if it looks too long. Okay, I warned you. I have been reflecting way too much on skin tags. The first two patients I saw on this trip, at the Akha clinic yesterday, after traveling 36 hours and experiencing major jet-lag, giving up 3 weeks of work at home, packing my expensive delicate surgical instruments honed with German precision, carrying 30 lbs in two backpacks wherever I go, receiving vaccinations and taking medications to prevent catching a disease, and enduring a 2 hour bumpy winding road avoiding car sickness, and after setting up two containers of medical supplies, in this dusky, powerless building, this very first patient wanted his skin tags removed from his neck. Skin tags, really? As I was blinking rapidly into his eyes with my bladder reminding me I have to pee, I was thinking about how stingy I have to be with the limited number of sterilized instruments that I have to use for this clinic, let alone for the next two weeks if I can’t resterilize them. I was strategically contemplating my response of “They’re benign looking acrochordons, you know benign fibroepithelial polyps that don’t have to be removed from a medical necessity point of view. It’s a want and not a need. And actually, you can tie a hair around each one and strangulate it and they will just fall off. Here, let me show you (so I can save my instruments for more important uses)” … I thought. With a deep sigh, I said “Okay” animating my two fingers in a scissor-like fashion and the patient nodding his head enthusiastically agreeing to the procedure. I took out my $1500 2.5X loupe magnifying surgical telescopes and my $1800 headlamp that I had been protecting and reluctantly pulled out my delicate sterile instruments thinking I’m now down to three sterile scissors and forceps and removed about 10 skin tags. He sat there as I clipped them off with precise surgical precision without an anesthetic (the needle would hurt more), grimacing with each stroke of the scissors. He was overjoyed and brought his hands together with a nod in a thanking motion. Okay he’s cured. “Cut to Cure” is our motto. “Okay, next patient?” The same thing; skin tags! I was thinking “You’ve got to be kidding, I need my instruments for something more important.” What are we, SkintagsRUs? Yes, they’re unsightly, distracting and I recalled from another trip when I removed about one hundred tags from his neck and armpits from a man that was so self-conscious he wouldn’t date. So I was at least thankful there were only 10. Now reflecting from the patients’ point of view. These have been bothering them for years with no tangible resolution, which made them self-conscious or uncomfortable rubbing and getting these nuisance tags snagged in clothing. They are not going away, in fact, they would get longer, bigger, and more noticeable with time, in addition to other tags that are starting to grow. So they may, indeed, end up with dozens of skin tags over the years. These two patients with hope in their hearts woke up early, walked miles in the dark to get here and be first in line, like a Black Friday sale, patiently waiting for the team to arrive unsure if we could help them. They would need to allow some guy who they don’t even know take a knife to his neck and he won’t move as a knife is placed a few millimeters from his carotid artery, hoping he won’t flinch. He’s going to be sweating and scared. To him, it is as important as taking out something else that shouldn’t be there (cyst, lipoma, tumor) and I should not minimize his concern and economize my resources. This is not cosmetic surgery to them and, believe me, I know cosmetic surgery; that’s what I do for a living. In a brief moment in time, we have to develop a trusting relationship, and treat this individual with care and respect in the manner that I would want to be treated myself. I had to take a step back and remind myself why I am here and realize what’s important to them, and not me. To reiterate, it isn’t about me. Shame on me! These type of patients humble me and in the world of me, me, me, look-at-me selfies, and social media and how many likes and followers we can get, we/I need to recognize others physical and mental needs and treat everyone with respect that each of us would want. I have taught my children to RSVP their loved ones: Respect them, make them feel Special, Value them, and make them feel imPortant, a Priority. We are here to serve and respect and love one another. John 13:34 Love one another. As I have loved you, so you must love one another. 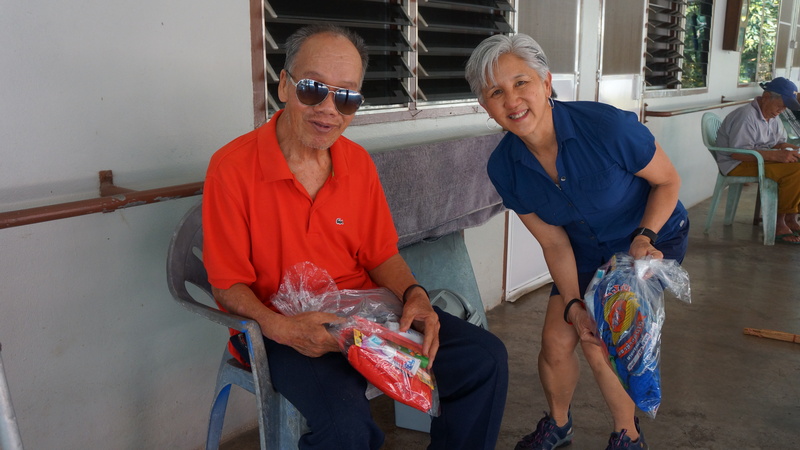 The patients ultimately got what they have been so patiently waiting for but God is also using them, so that I can be more like Christ with a more loving and comforting attitude, strengthening my relationship with our Lord and Savior, Jesus Christ. God works in mysterious ways. We met at night with Pastor conducting lessons from the Chapbook and Kane leading us in music. We grow closer as a team spiritually and emotionally. There are a lot of tears tonight. We continued this theme of how the team has been affected by the patients that we treat with what instruments that we have. Lynelle was sharing her frustration on how limited care she was giving with the make shift instrumentation which was below her own standard of care. We have our own personal standards, but God has His. We learn a lot about ourselves on how numbers of people treated and productivity is not the important measure of success but rather how we can just expose our audience to the wonders of God’s love so that we may ultimately glorify Him. Also congratulations to my sister Daphne and her fiancé Dale for their engagement! Nice rock for a birthday present Daphne; you did good Dale! We apparently missed a Kodak moment last night. Ming, Chris, and Kane were hanging out in the lobby about 9 pm and Ming decided to go to bed. A few minutes later Kane heard, who he thought was Elvis Presley in the flesh, singing, “Can’t Help Falling in Love” accompanied by the pianist. To his surprise, it was our very own Ming singing into the microphone doing his best Elvis Presley impression. It is hard to believe because I just can’t imagine Ming gazing into the pianist’s eyes singing that song since he doesn’t look anything like Yolanda. Well we might just see Ming on the next America’s Got Talent. MTI is up at the crack of dawn. Many of us are still adjusting to the time change. Some energetic members take walks early in the morning and hit some markets for treats. One insomniac is compelled to blog in the middle of the night so he won’t take time away from his forever-patient wife during the day. John gets in a quick, 5 mile run. Today, we traveled about 2 hours along a winding road to Ban Huai Kee Lek School in the Akha village, a village that we haven’t been to before but Luka goes there monthly. 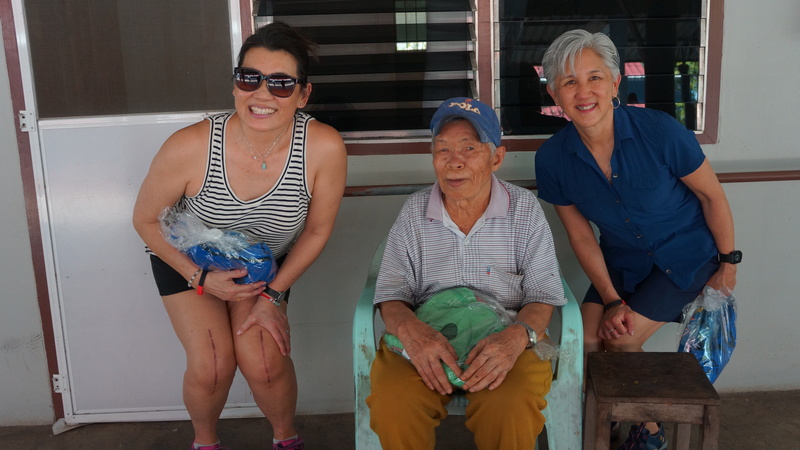 We really get a sense of serving at these outlying villages knowing that they are not privy to the country’s health care system and it would be a hardship to go down the mountain for health care. We rode in these nice vans today, thank God. Yesterday, we traveled in the back of the school bus that FCBC bought for AYDC about 5 years ago. Its showing signs of wear and the team were tossed about in the back hitting our heads on the overhead bars that we were grasping many times sitting on worn out seats cushions. Many of us have our own, ahem, anatomic seat cushions but it still hurts today. Andy is a brave sole and was clinging for dear life standing on the bumper on the back of the bus. It looked like he was even taking a nap! That’s when Andy waved to the colony amputee who then followed the bus for about a mile in this hand-powered tricycle back to the compound just to see visitors. 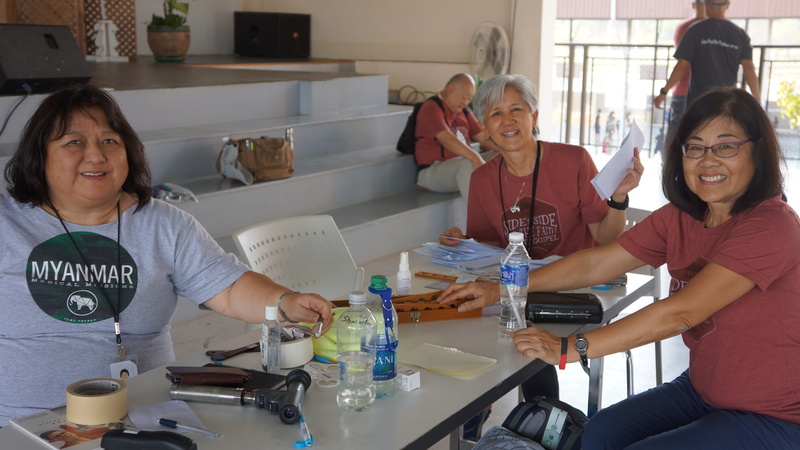 The Ban Huai Kee Lek school is closed and the structures are empty due to the dwindling numbers of students but we were able to use the facility as a clinic. Some of the village students go to AYDC which houses and teaches children from these many distant villages. 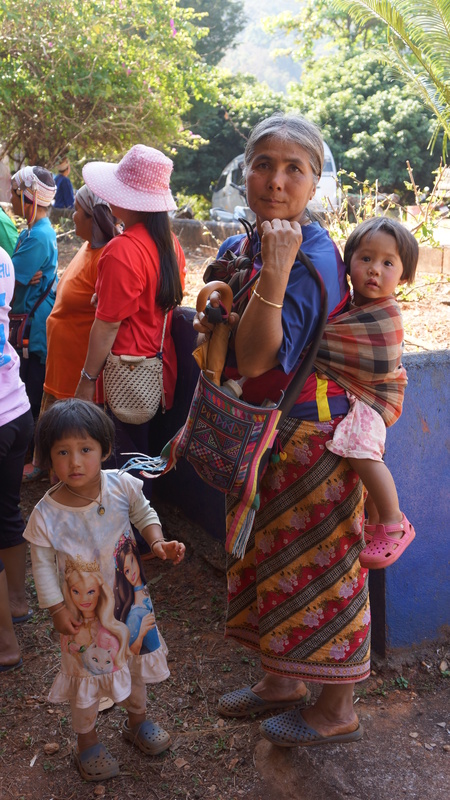 Residents in this mountain village were ready to be seen when we got there and had to quickly set up our individual clinics. Our interpreters were invaluable for communicating with the villagers. We saw many dental, optometry, and medical patients. 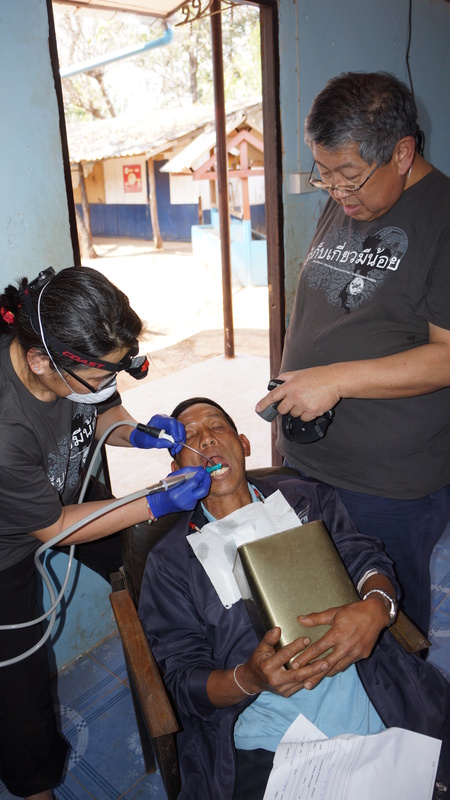 We are still limited on heavy duty cleaning due the lack of dental equipment but they always can do extractions of bad teeth and scaling with makeshift tools. 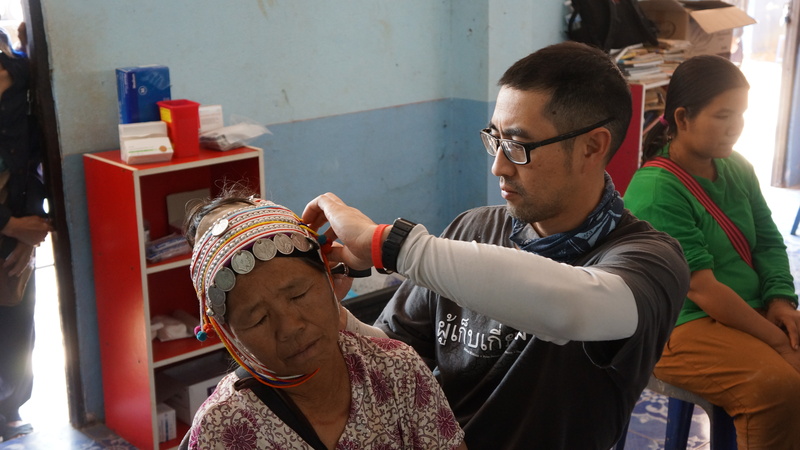 The villagers are manual laborers, as such, the medical team saw a lot of repetitive stress injuries and low back pain and we were lucky to have a nice supply of steroid injections and anti-inflammatory drugs to treat these chronic conditions. We also seemed to have been running a skin tag removal clinic as men and women alike wanted them removed. The optometrists are examining patients with a single retinoscope and making prescriptions for lenses that we will have to grind back in Fresno and then assemble them with frames into wearable glasses. 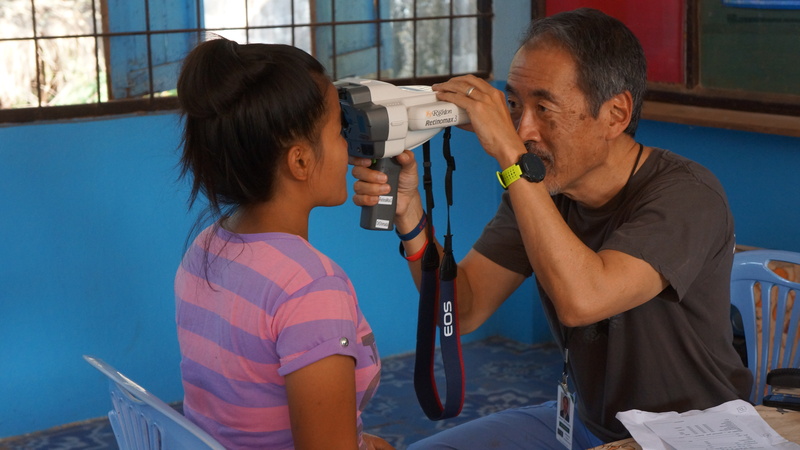 Dr. Akira Tajiri, an optometrist who has gone on the mission trip before, invented the current lens/frame system that we use and has donated all the equipment and lens supply as well as control of his non-profit organization, Precise Vision Enhancement, to FCBC so that we can continue to provide glasses for future missions. 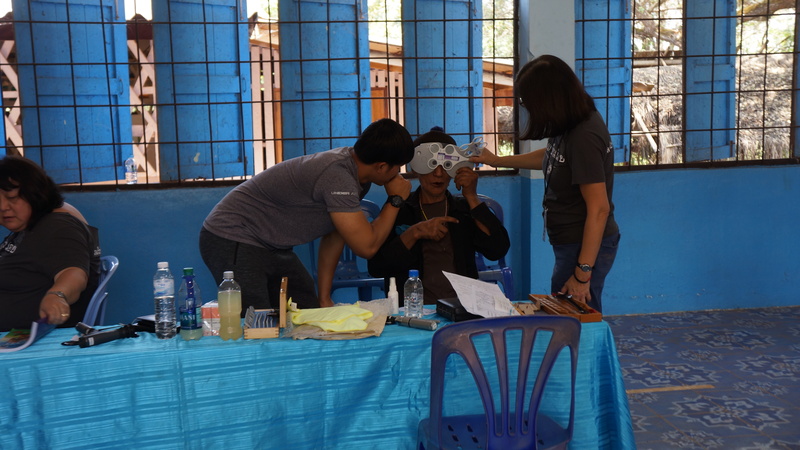 We had to go through the same process after the last mission trip in 2017 and then send the glasses back to Thailand for distribution. Luka and Ghan will be coming to the USA in April so they will able to take them back with them. So keep a look out when they arrive in April. All in all, we felt productive at this first pit stop and things are looking up for this trip with what we have at hand. Ghan met with a health administrator to try to get the equipment released and retrieve the missing bins. No final word yet. The villagers prepared us a nice lunch and so far no one has gotten ill. Dr. Patton scared us when a fragile plastic chair broke from under him and he fell back and hit his head. No blood or stitches needed. I personally wasn’t worried because despite his kind and gentle demeanor, Dr. Patton can be hard headed at times. I got a scare along the way up the mountain when I was videotaping the outdoors with my new action camera on a selfie-stick when it hit a tree branch and flew off at 15 mph! We stopped and one of the drivers found the Osmo Pocket in the leaves on the side of the road. Okay, I admit that it was obvious that was going to ultimately happen but better that than getting my arm chopped off! Happy Birthday to our daughter Allison (sorry I missed it AGAIN) and to my sister Daphne! Hope you both had a great time of celebration. 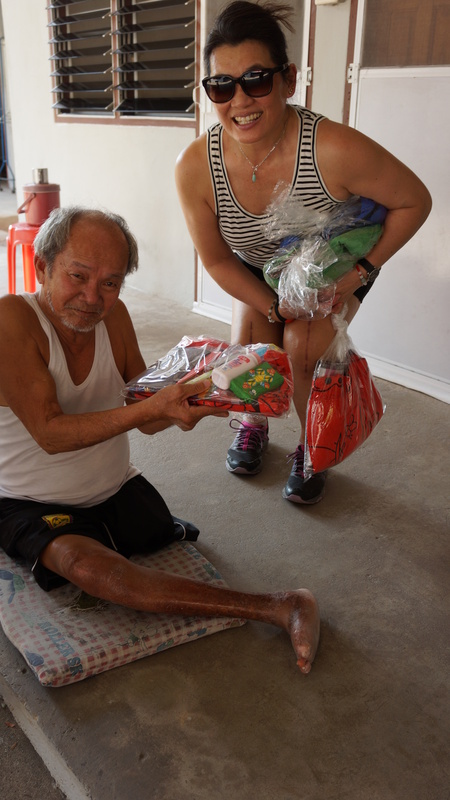 We still have no word on the missing bins or those that are under the possession of the Thai customs but today is preparation day so we went to 2 pharmacies and a medical supply house to get some needed drugs and surgical supplies. Fortunately Bill has his makeshift “steam sterilizer” that can sanitize our instruments and it’s funny that Gail mentioned that she’s missing her favorite pressure cooker. What a coincidence? 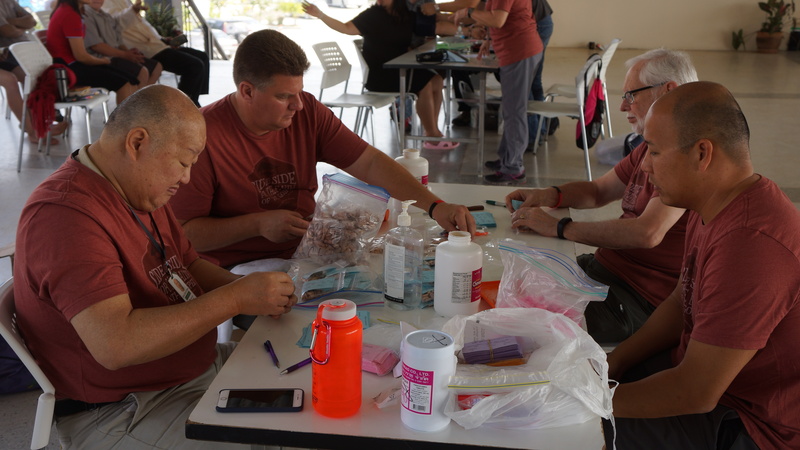 We raided the guesthouse at the AYDC (Akha Youth Development Center) and to much of our surprise we found a plethora of medications and supplies in storage that we can use on this trip. 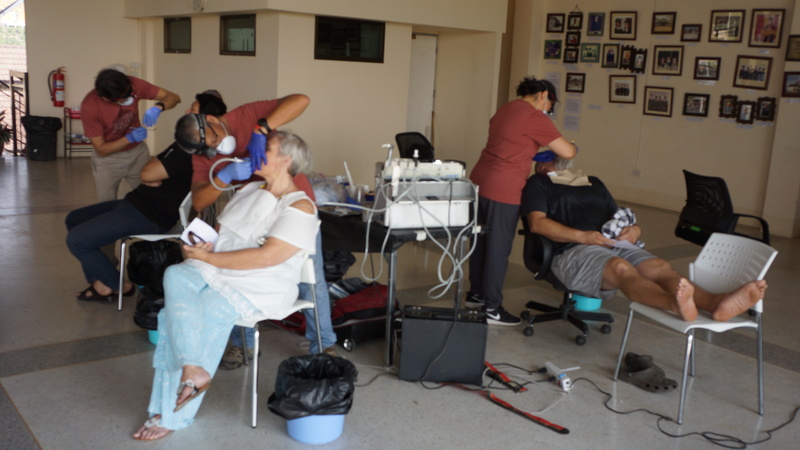 The dental team also scavenged so dental equipment that has been left from previous trips so we are in better shape than we thought. God provides. Halleluiah, God is good! Bill promises this will be our easiest trip E-VER with no monsoons expected, no riding ox carts, no leaking boats, no military junta confrontations, no sleeping on floors under mosquito nets, and minimal squatting on toilets AND we will have running filtered water and electricity. We will have to teach Ed the proper etiquette, technique, and grace while attempting the squatty potty. Ed also mentioned that it seems that all we have been doing is eating. Well Ed, we never know when our next meal will be coming and you know what happens when they stuff the pig, it soon will be slaughtered. So be prepared, we are just getting started. Speaking of pig, Gung Hay Fat Choy! Happy Chinese New Year! 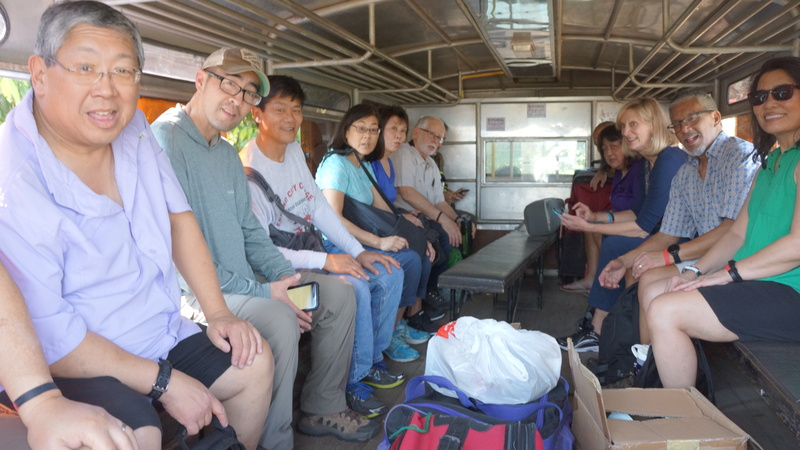 Our itinerary includes visiting the AYDC, several Akha villages, two schools, Pastor Phongkaeow’s compound by the Laos border and a prison. More details to come but one of the villages that we are going to, was part of a command center when the soccer team of boys got stuck in the flooded cave for days just a short time ago. 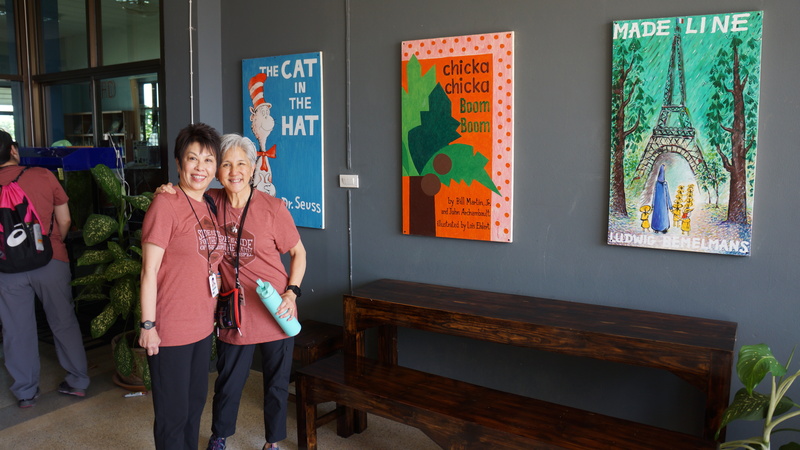 Ghan treated us to a wonderful lunch at her home and some took a tour and looked at some of the renovations while others rummaged through the supply room. Goo long hummaday Ghan! After lunch, we travelled to a “leper colony” to visit the residents. 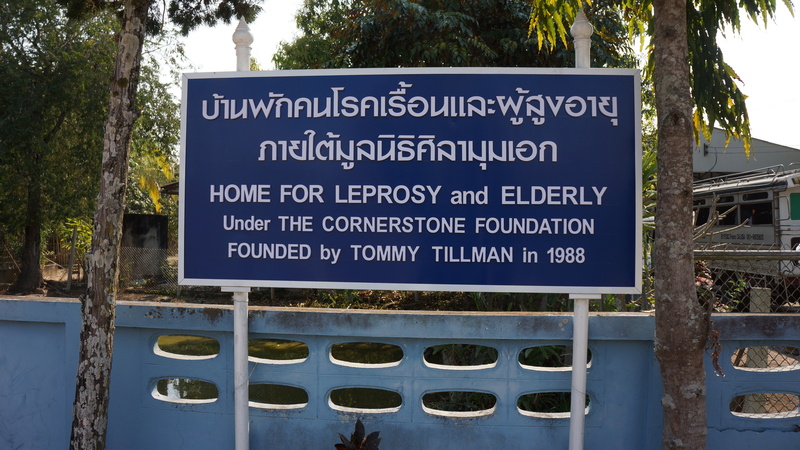 It’s called the Home for Leprosy and the Elderly, which was founded by Tommy Tillman in 1988. No all, but some of the residents had been inflicted with leprosy and some extremities were disfigured or amputated. The resident don’t leave the compound much and yearn for visitors offering them the human touch. There was one elderly man riding a tricycle that we passed by and Andy waved at him. 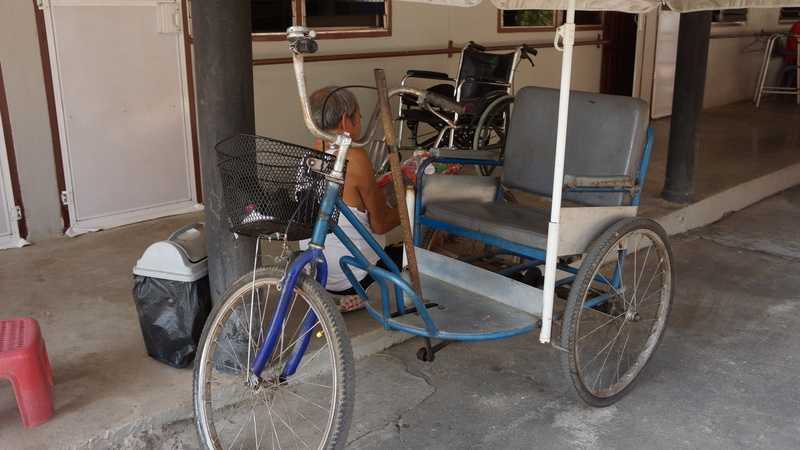 He propelled his trike with a vertical stick that he moved with his arm in a forward-backward motion and followed the bus all the way to the compound. It turns out that his leg was amputated from leprosy but that didn’t seem to stop him and he lived at the compound. 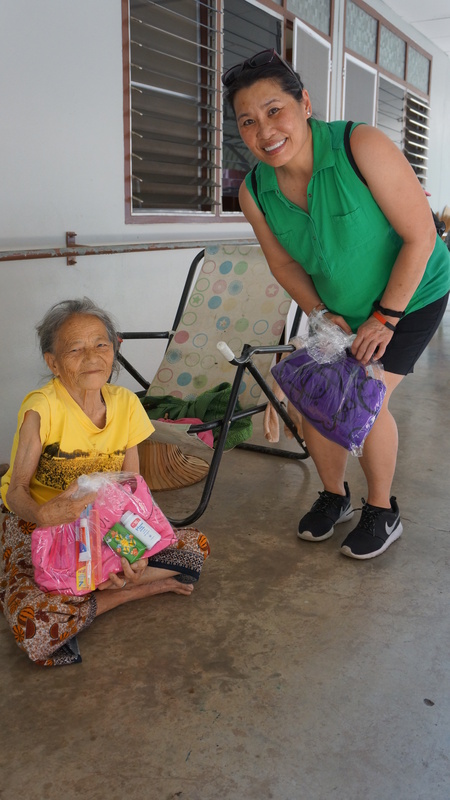 Earlier in the day, some of the team members went shopping to bring the residents food and everyday hygiene items as gifts. We treated them with respect with minimal photography and we weren’t there to feed our curious minds. Actually, I think taking photos with them was welcomed. You see, Andy had visited the compound 6 years ago and took selfies with many of them. Some residents passed on but those that remained who had their photos taken with Andy he recognized. He was showing them on his phone and they were smiling together and it brought tears to Andy. One lady reminded him of his grandmother. We all can use a hug and touch from time to time. This was certainly a touchable moment. We will see if we can print some photos and have them delivered to them in the near future. We closed out the night with Kane leading songs playing his petite guitar and Pastor’s lesson with the Chap book. Though we seem to be providing services to those under served, it’s more about developing our own personal relationship with God. I think I got it but I’m still jet lagged and will have to ponder that lesson and “hold that thought” because I need to get some shuteye. 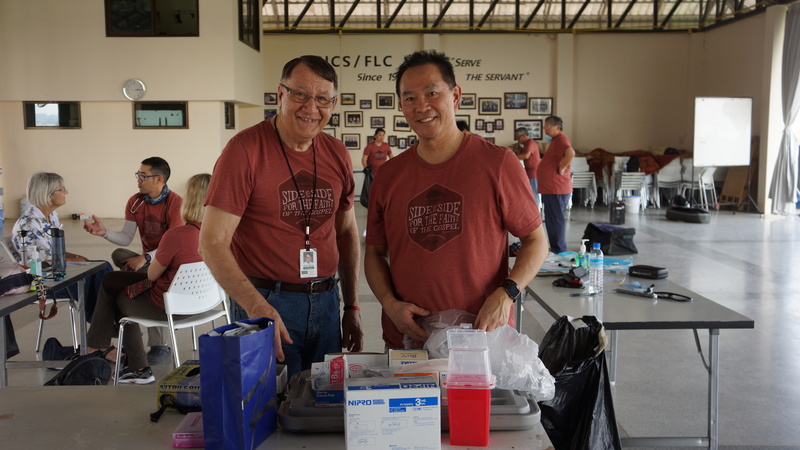 Hello Friends, Family, and Fans of the FCBC medical mission team. 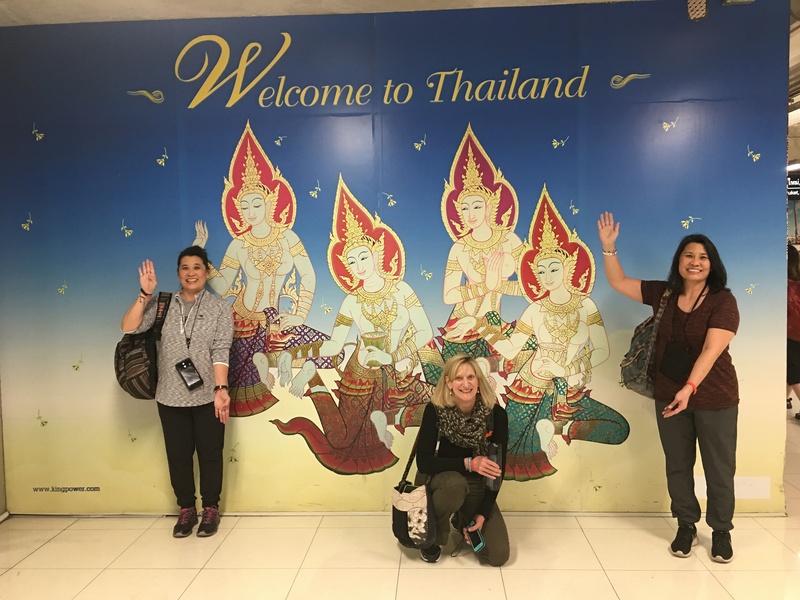 It’s been two years since my last entry and now it is exciting to begin this mission trip to Thailand. 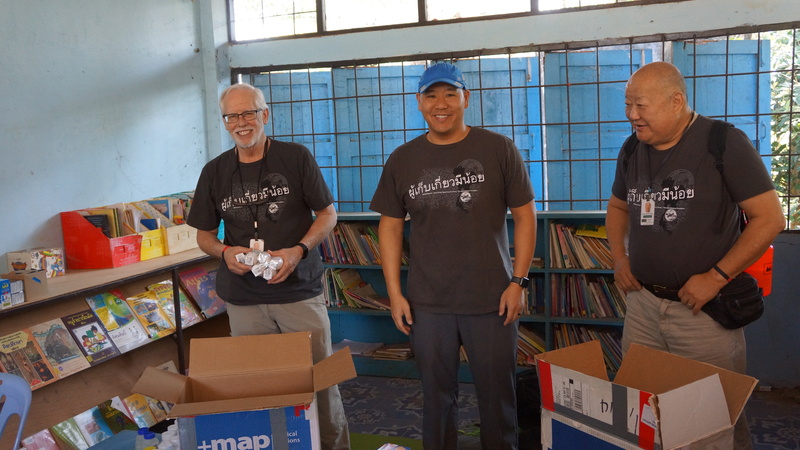 First of all, on behalf of the mission team, we would like to thank all of you who prayed and participated in the planning and fundraising to make this mission trip possible. Special thanks to Bill and Gail who lead this team with impeccable organizational skills each and every trip. We thank the Naomi-Ruth group for sending us off with goodie bags and for Sonja Middleton (Ellen’s daughter in-law) who owns Chic-fil-A (Riverpark) and donated wonderful boxed meals for our bus trip to LAX. We thank Kane who donated “Because He First Loved Us” T-shirts, and to those who sent us farewell in Fresno and LA. It is Sunday, so we lost a day. How time flies, literally. 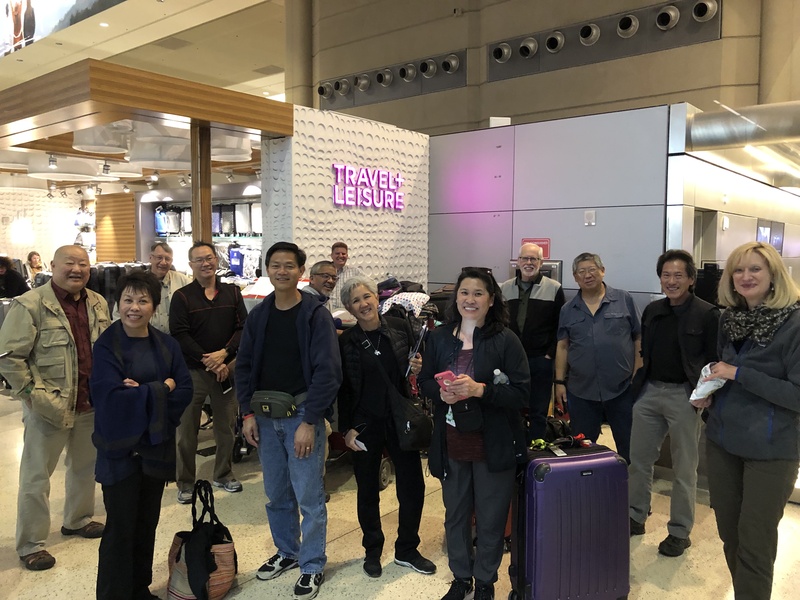 😉 We embarked from FCBC from about noon Friday with a busload of team members and our luggage/bins of supplies and met up with the SoCal contingent at LAX. 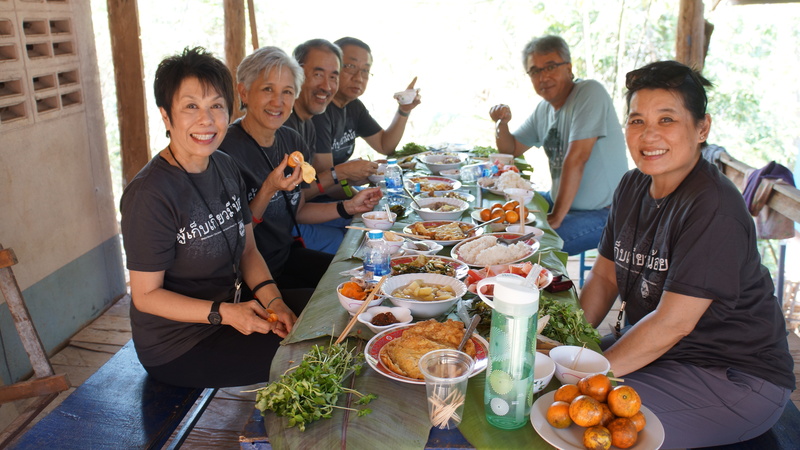 The 2019 Mission Team International (MTI) is comprised of members from a variety of churches but who all have ties to FCBC. 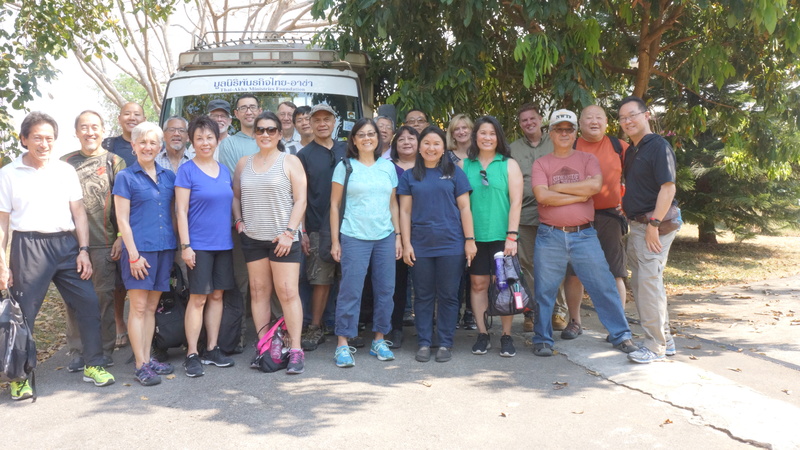 They are Pastor Danny Jack, Ming Chong, Bill Ho, Gail Ho, Lester Lowe, Larry Lowe, Lynelle Winn, Lynette Yuen, Andy Alejo, Diana Lee, Lisa Shimada, John Shimada, Mark Patton, Jack Patton, Kane Kuo, Ellen Middleton, David Chow, Chris Chow, Ed Eng, Lena Chin, Mark Chin, MD. 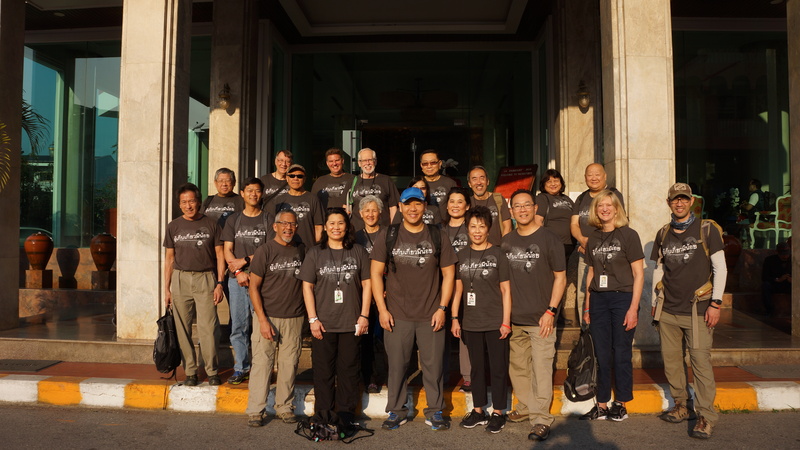 It took over 36 hours, door-to-door, to go from Fresno–LAX-Taipei, Taiwan–Bangkok–Chiang Rai arriving 6 pm Sunday local time at Wang Come Hotel crossing so many time zones that were all zoned out and we all are sweaty, stinky, tired, sleepy, and hungry. AND we hit another snag at the Chiang Rai Airport. We have two supply bins MISSING and we spent two hours in customs trying to get about 10 bins/luggage released. They’re confiscating drugs, needles, scalpels, fluids, anesthetic agents for medical and dental, and optometry equipment. Déjà vu! Here we go again! 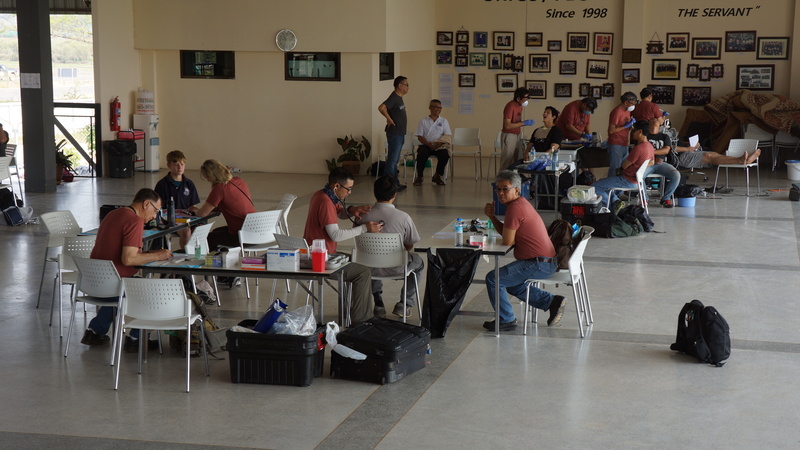 The last trip customs kept a lot of dental and medical equipment at Chiang Mai airport and so the dental team resorted to painting buildings instead. I guess it’s the medical team’s turn to add a second or third coat of paint to those buildings. Please pray for customs to release our supplies, since it has now gotten very tight under military rule, and pray that we don’t have to bail out our fearless leader, Bill Ho. 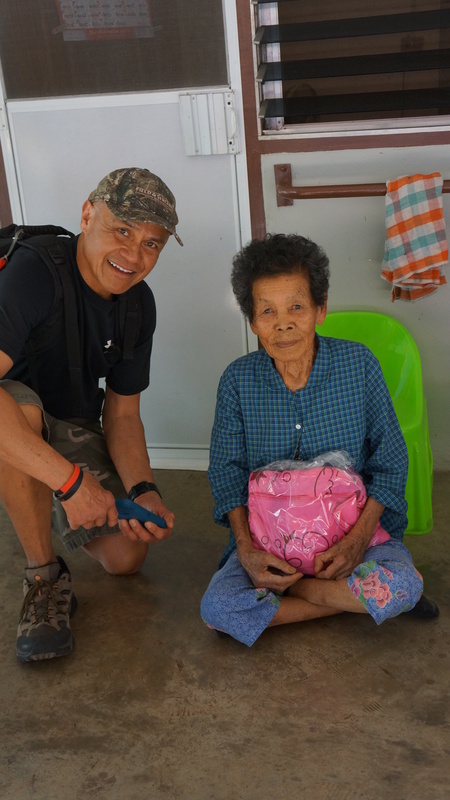 This is Ed Eng’s first mission trip. Ed you don’t even know what you’ve signed up for! You should have read my previous blogs with warnings of monsoon flooding, flesh-eating mosquitoes (they like Chinese food), dysentery, and gun-wielding soldiers. You notice that there is no one is wearing his or her MAGA cap around here. It’s really not that rosy brochure Bill gave you when he was recruiting you, of tourists sipping mai tais on the beach with bikini-clad natives fanning you with banana leaves in the hot sun. Oh it’s hot all right (over 90 degrees today) and we have already found out that it’s humid as well. We are all too tired and will forgo the usual rookie hazing, besides, your a nice guy and has a good sense of humor and were going to need your laughter. Marlene, we will keep an eye out for your man but when he goes out for those famous Thai massages, he’ll have to find out what they mean by “happy ending” himself. Well, all was not bad. Our demeanor changed when we saw old friends Ghan, Luka, Goo Gai, Plah and Gi and they with their children who we have watched grow up over the years since 2006! They are growing up so fast and have a bright future ahead of them. After all the airport and airplane food, we were treated to a wonderful seven-course Thai meal including mango sticky rice, my favorite! 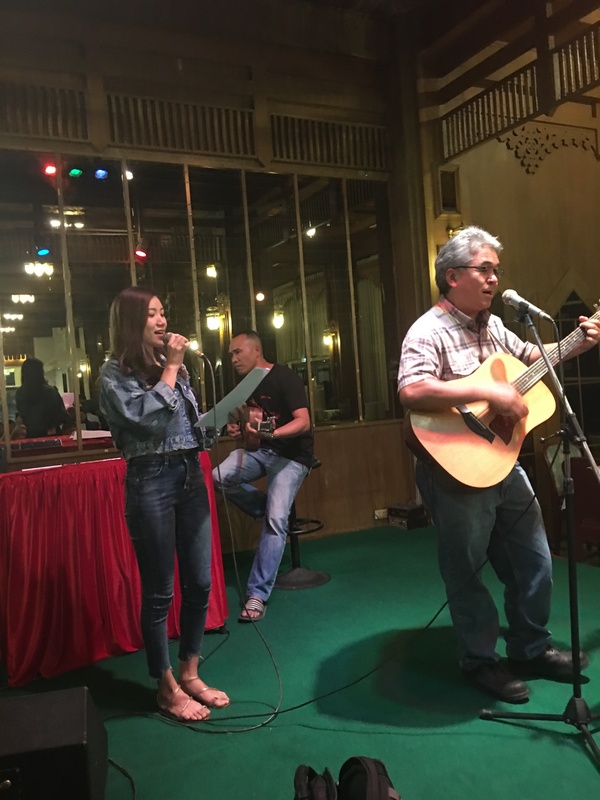 Luka, Goo Gai, and Gi sang some songs as well as Mit and Wan singing some contemporary music. We all sang “Happy Birthday” to Bill, Ellen, Lynette, Lynelle, and Jack and ate some cake. Our anguish turned to joy and excitement and we enthusiastically look forward to what God has planned for our mission trips this year. Our obstacles may just be detours on how God wants us to trust him and follow Him. It’s interesting. While I was watching the movie, Crazy Rich Asians, on the plane I was reflecting on how different cultures and people live and what a contrast in lives that those decadent people in the movie portrayed and how that compares to the people that God has asked us to serve here in the villages of Thailand. What does “rich” mean to you…wealth, possessions, or God’s love? Lena purposely left her iphone at home. Some of us would feel naked without it and without contact to the web. She said, “My gosh! I want to feel the Holy Spirit and to feel God’s love and not be distracted with phone calls, emails, or social media and focus on God.” Quiet time, what an interesting concept? May we all take a moment and silence our cell phones and focus on how rich you want to be. We had a day of R & R Wednesday to supposedly rest our weary bones. You know how that goes. Usually you do more strenuous activities than expected because you get antsy just sitting around. One of the attractions that we have enjoyed before has been riding the elephants. 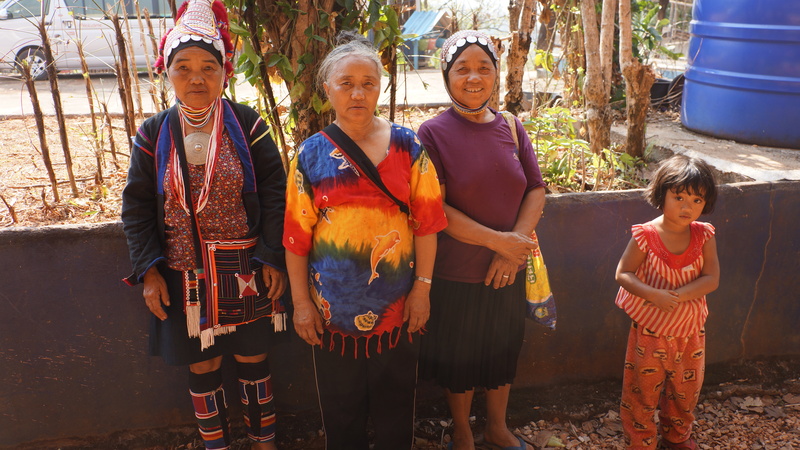 The Karen tribe has nicely commercialized this endeavor and we thoroughly helped support their cause and their way of life. I don’t know how many of you have ridden an elephant, much less petted or fed one, but these docile appearing creatures are quite massive in size and impressively strong. We climbed aboard stepping on its neck and went for a slow jaunt about 2 mph. We strolled through the river and village getting a little nauseous but I was afraid of dirtying the river until I saw what the elephants dumped in and then I didn’t care. There were a few floaters that we had to dodge but when nature calls, the elephants don’t hesitate. Anyway, I was a pleasant, if not rocky, ride and then we fed them corn, sugar cane, and bananas. One mighty beast grabbed and uprooted a banana tree and just held it in its mouth until later eating it as a snack. They also had an area to pet large snakes and lizards but no takers in this group as they slithered to the vendors. Another group went to Mae Fah Luang Gardens in Doi Tung where the King’s mother (Princess Mother) helped the hillside ethnic tribes change from growing opium years ago in to teak, coffee, and fruit. It’s a beautiful garden to explore on the ground and in the air. Our last day of work was at the Sahasartsuka School where Luka was a young student. An American Baptist Missionary, Cecil Carter, founded the school in 1957. There are over 2700 students of which 80% are ethnic hillside tribe and 20% Thai. Sixty per cent of the children are Christian while 30% are Buddhists, and 10% animistic. The children are quite polite and proper lining up their shoes outside and waiting in groups to be seen. 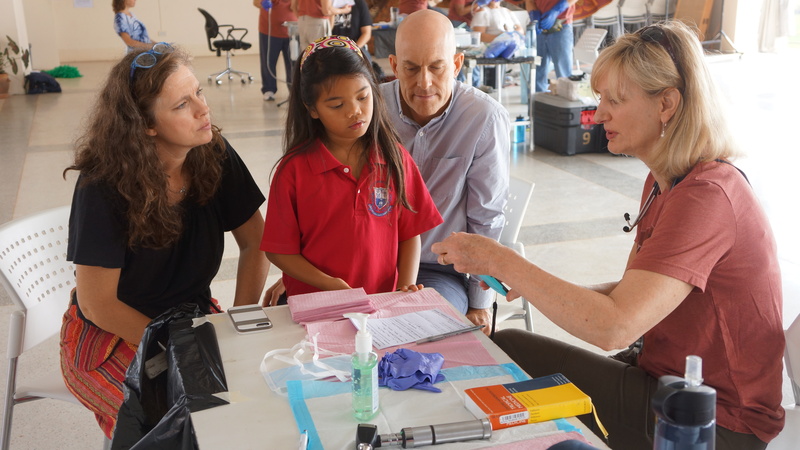 The dental team did a wonderful job at screening and evaluating these children in their important time of teeth maturation and despite the lack of tools Lester literally did hands on manipulation on a child with a loose tooth. After looking around unsuccessfully for a doorknob and dental floss, he did it the old fashion way and just loosened a tooth with his hand until it came off. The child was comfortable without anesthesia and happy the tooth was out and anxious for the tooth fairy to come that night. Larry continued the oral examinations as Lynnelle gave out toothbrushes to the children and instructed them on proper use. The medical team dealt with lice outbreaks and treated dozens of children. Lice give me heebie geebies so I let the rest of the team deal with them medically otherwise they might have gotten a shave from me a la Snead O’Connor. I just didn’t want to be nit picky. My scalp itches just thinking about it. Does yours? There was a touching moment with Ghan was interpreting for a 14 year-old patient of mine and she thought she looked familiar. She asked a few questions and then realized it was one of the children who lived at AYDC when she was seven. Tears flowed with the reunion with Ghan just happy to see her growing up. After the school clinic we headed for AYDC for a special ceremony. The children of AYDC wanted to thank FCBC for their donations and past support, which allowed the purchase of the bus that they have been using over the years transporting the children to school, and for building the new boys dormitory. As I mentioned earlier, the massive earthquake in 2014 destroyed several buildings making them uninhabitable. Both the girls’ and boys’ dormitories had to be rebuilt. FCBC help raise funds particularly for the boy’s dormitory and they had a program of gratitude and dedication of the building. Almost all of the children in various groups sang praise songs such as “All and All” and “How Great is Our God” for us and several gave a thank you speech. Ghan and Luka’s children and friends sang one of my favorite songs, “Give Thanks (With A Grateful Heart).” The medical team was presented with wreaths of beads, handmade bamboo cup, and bag of gifts. It was over to an hour of song praise, and thanks followed by cutting of the ribbon and a tour of the building and coconut ice cream! It was really touching how this act of gratitude, which took a lot of time of practice and organization, was carried out for our benefit. No one expected it or anticipated it and it caught me completely off guard to show their appreciation for what FCBC, which includes not only the medical team, but also the congregation. We should be proud that we are in a position to help those in need and less fortunate than us and be thankful for how God has blessed our church. I am a proud member of FCBC and I feel privileged to have an opportunity to be part of a wonderful team of professionals and caring, unselfish individuals who make financial sacrifices while risking life and limb. 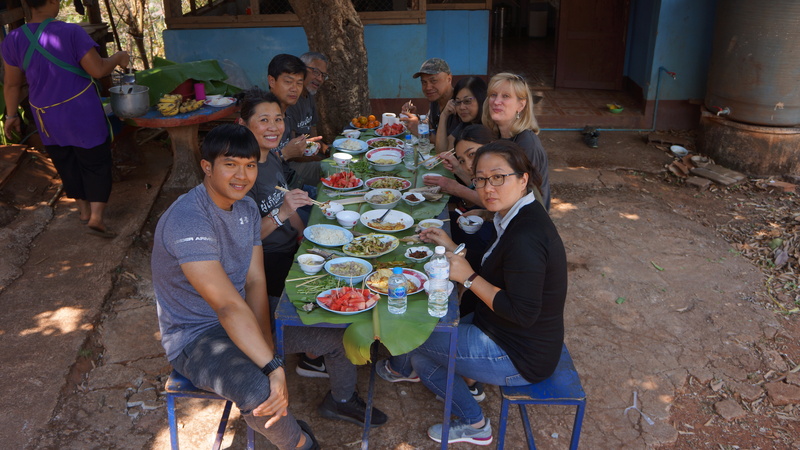 It has been a blessing to get to know these people of Myanmar and Thailand especially to know and work with the Akha people for over a decade. I am humbled by their compassion, thoughtfulness, and acts of gratitude. I believe that we are taught to serve without the need for thanks only because God is the very reason that we are able to serve in the first place. God has been in control this whole mission trip and although we thought we had limitations because of the lack of supplies, it allowed us to be more reliant on Him, than on ourselves and showed us different ways that we can serve and glorify Him than we had thought. I thank the readers and the supporters of the FCBC and their efforts to provide future mission trips. Your thoughts and prayers have helped us get through these difficult two weeks and many of you would have like to come on this trip. Willingness to serve is the first step and all these team members contributed to the success of this mission trip by showing up and I am proud to have served next to them. Thank you all for this experience that I will never forget. For those who can’t go on these trips but want to help out, please help financially to support future mission trips. There is still a need to build water towers for the dormitories so that the water supply and flushing system would work optimally and we will need to raise that money in the near future. Please think about giving to help this project come to fruition. If you would like to donate or need more information please contact me at mchinmd@aol.com. Thank you for your consideration. I leave you with the faces of the future. The prisoners seemed to be content at the moment to serve out their time. They have adjusted to their incarceration and have no choice to experience the same routine day after day. No hard time here nor balls and chains or rocks and sledgehammers. Metaphorically speaking, we can become prisoners ourselves. It could be that we are prisoner of wealth, greed, materialism, drugs, alcohol, lust, infidelity, pride, and we get used to the same routine. We are enslaved by habits, and routines, and succumb to temptations. The difference is that for most of these prisoners, they will be able to have a change in their current routine when their sentence is up and they are set free. We, on the other hand, may be sentenced for life due to our habits and greed. Will we ever be satisfied? Will we be set free? Psalms 37:4 “Delight yourself in the Lord and he will give you the desires of your heart.” We need to focus on rejoicing unto the Lord so that our desires are God’s desire then we will not go unfulfilled. Yes, I still buy the Powerball Jackpot lotto ticket, but I truly know that the winning the lottery is with God’s salvation and the eternal treasures of knowing Christ our Lord. Thank you for reading these blogs as I realize that this is just one small portion of the team’s perspective on the trip. Sometimes I sound like I’m preaching when I don’t have the authority, knowledge, or experience of many of you who are more biblically versed. These blogs are a personal reflection of my thoughts, which allow me a deeper understanding of what this experience is to me or how God is talking to me. Sometimes it’s an epiphany and maybe it might provoke your own thoughts and understanding of God’s message. Okay we got out safely, I don’t ever want to go to prison so I will have to keep my nose clean and ask for forgiveness for my sins. I’m putting back the hotel towels and ashtrays where I found them but maybe not the toilet paper though since I interpret that as a “God will provide” moment. I will not try to find a massage parlor that offers “happy endings” even though there are a plethora of masseuses around us. Literally there are dozens of parlors within walking distance and I will have to go “La la la la la la la, I can’t hear you!” with my ears covered as the catcalls are directed my way. God knows what we need and he will provide. It felt like we were back in Myanmar (they regulate because suddenly about 8 pm the city went dark. Completely dark, literally, lights out. A citywide black occurred and we were concerned with team members lost in the dark. However, it didn’t damper some die-hard twin sisters, whose names I won’t mention, from shopping in the bazaar since they used flashlights and taking advantage of the vendors who needed to make quick sales as the tourists scattered. I’m often hassled about bringing too much on mission trips but Bill didn’t seem to mind when I handed him an extra Goalzero lantern to complement his computer screen output. Most of us had flashlights for personal use but I felt a little guilty since I had multiple backup lights and resources, so many, that I had to put towels around the door edges so that not too much light would shine through the cracks and attract people, err, I mean mosquitos towards our room. Okay, add, “I will not hoard Goalzero lanterns” to my list of greediness even though others came ill prepared. As we prayed for electricity, there was a voice heard from above “Let there be light!” and behold, the lights came back on after about an hour. God will provide. Happy Birthday to Lynnelle and Lynnette! Since we have gotten to know Lynette, it has been double the pleasure! Happy Birthday to my sister Sandy as well, and I hope you had a great party! 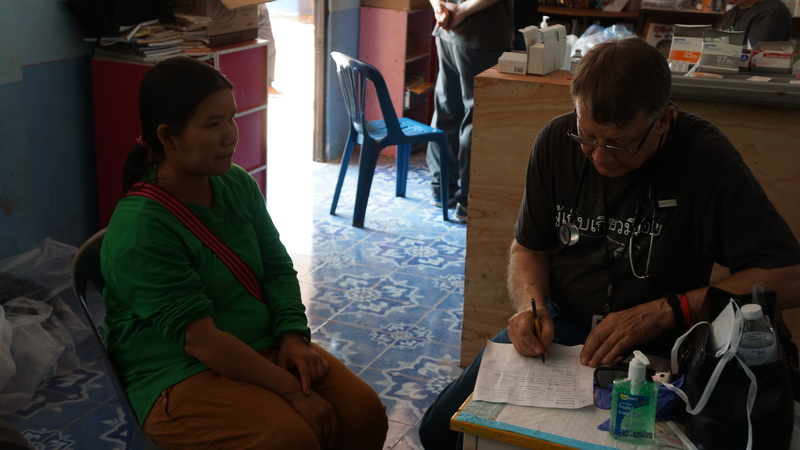 Today we return to the medical health clinic near the Huisan Village, which has been the most modern looking facility. We worked side by side the existing clinic obligations and they were very accommodating. 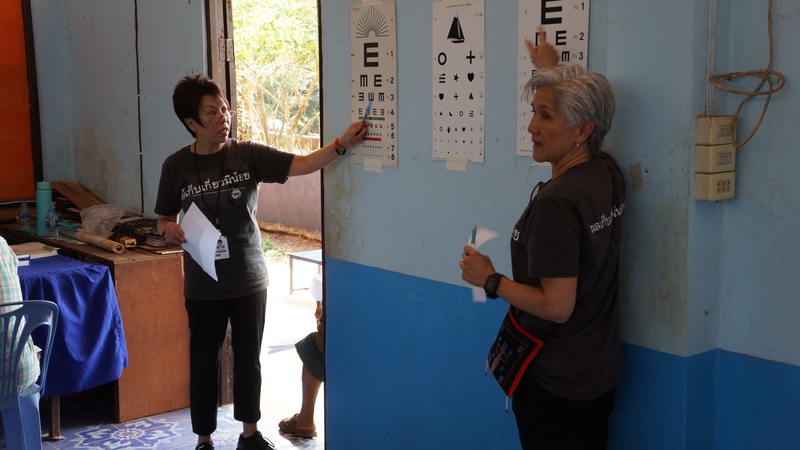 The eye clinic was, as Lena put it “women united” as the male team members had other duties. The eye clinic set up shop inside right next to the surgical suite where Leo got to take off a few lesions including a gigantic sebaceous cyst so he got one too. Leo also took off a calcified tumor off a lady’s forehead in the shape of a heart so she wanted to take it home. Leo was in the groove as he was in his element and as a newbie he jumped right into anything and everything. It’s great to have him aboard. Zina, our surgical nurse has been fantastic organizing and making the surgeries flow smoothly since she can anticipate So far we are managing on what we were able to find from storage, finding supplies at the medical clinic, and buying supplies locally. Since we are rationing suture material, we have to be innovative so Leo used superglue, yes, superglue to close the wounds of his three patients. The benefit is that no sutures will need to be removed. No problem. A lot of patients had repetitive stress injuries and just wanted to feel better so that they can go back to work. Many steroid injections were given in hopes of alleviating some inflammation that they experience day to day. Some were repeat customers from years past and some patients with chronic conditions such as Parkinson’s disease or chronic fractures or dislocations that weren’t repair could not be helped much. As I had mentioned in an earlier blog, there was a strong earthquake that rocked Thailand with the epicenter near the AYDC compound. There was a medical clinic attached to the old sanctuary, which was demolished and then resurrected on the site of the old sanctuary. The clinic was built not too long ago and needed to be painted inside and out. Fortunately, God tapped the team’s talents of brain and brawn and Mark Patton’s general contracting experience to picked supplies the day before. The Lowe boys used a pocketknife to take apart shutters off the windows to paint. So under General Patton’s direction, Andy, Lynnelle, Larry, Lester, Mark, and Pastor Jack baked under the hot sun painting with rollers and brushes in awkward positions straining neck and arms, tirelessly, first priming the surface followed by another coat of paint. They came away with paint on their face, body, and clothes like a two-year old playing with finger paint but by the end of the day it was a first class job. One benefit was that the gang has really nice Hawaiian Tropic tans. 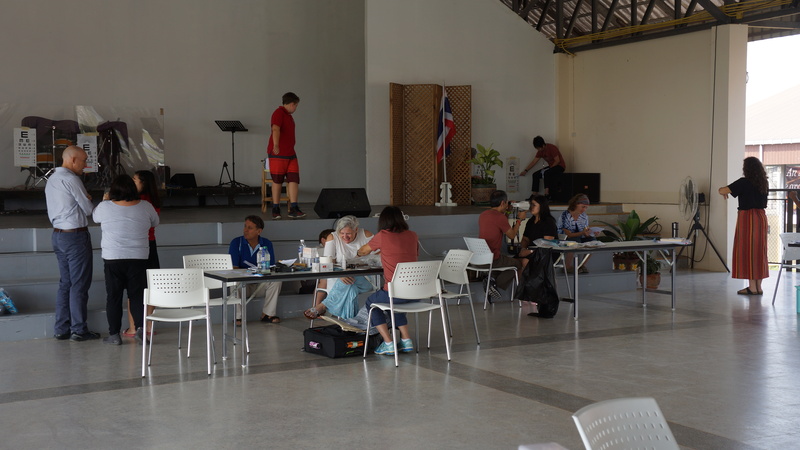 May God continue to bless our time with these wonderful people of Thailand and grow together in Christ. Bill has always looked to keep the cost down on these trips and the Golden Triangle Inn and we lucked out because the GTI was more expensive than the Wangcome Hotel we are at now and it is pretty nice. Air conditioning and warm water is about all we need at this time but the rooms are nice and the buffet breakfast has quite a variety. Most of us slept pretty good after a night of shopping and stuffing our bellies with mango-sticky-rice and Swensen’s Ice Cream. Thanks Bill! We drove to the Huisan village where we had Sunday service. This is the main church of the Akha village that we are all familiar with. We saw the new sanctuary that was built after the earthquake since the old building was not structurally sound but a new medical clinic was built in its place since that was crushed as well during the earthquake. The sanctuary was beautiful but I had to get my bearings right because I tried to sit on the ladies side and Lena had to point me to the correct side. I forgot that there was not coed seating in this church. It was very special to see familiar faces that greeted us with warm hugs and smiles. It is very important to maintain these bonds and we felt as if we were just here. 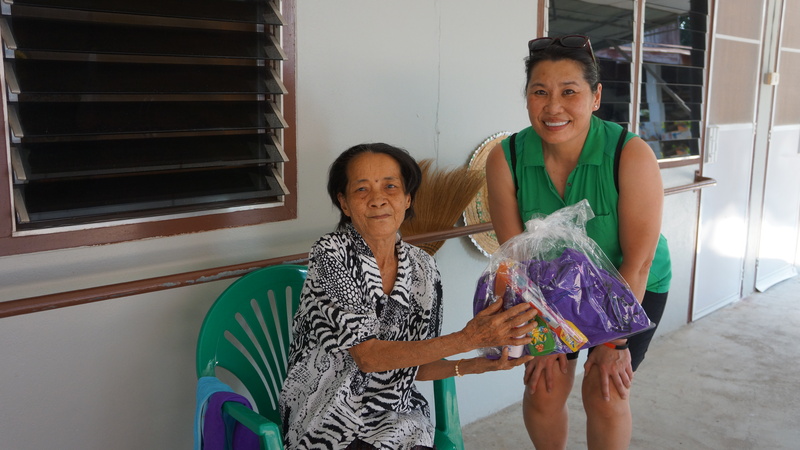 We have established this relationship with this village over 10 years ago and we cherish their friendship, as they are appreciative of what we share in spirit, love, and fellowship. The pastor and the head of the village welcomed us and thanked us for coming. Both Pastor Jack and Pastor Kim were able to give messages to the congregation with interpreters and we celebrated in the word and in song. 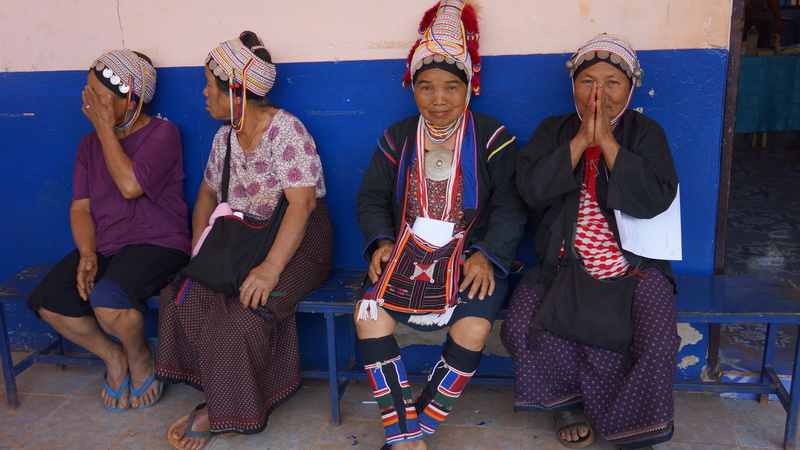 We were treated with traditional Akha dances by both young men and young ladies in Akha attire. The church then prepared a wonder meal in the education wing. How I love the fresh fruit! 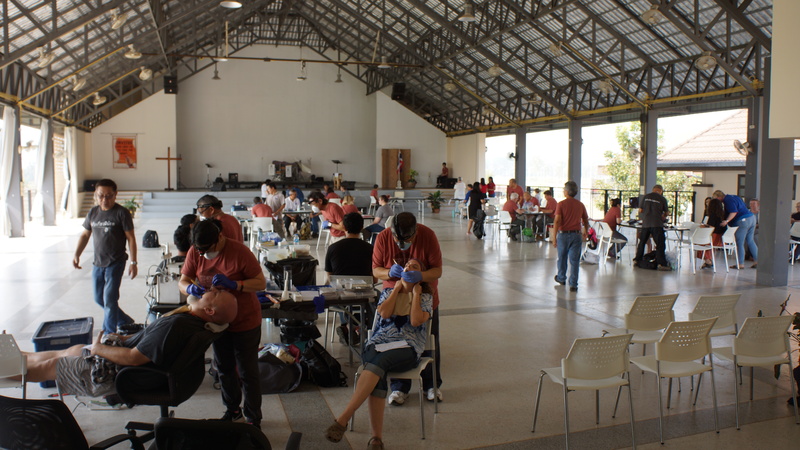 We had a productive day during clinic for the medical and eye team setting up outside the sanctuary. The dental team assisted with the pharmacy helping organizing for an efficient flow. We have been doing quite well with what we have in supplies. I was touched by the gesture of a man from whom I removed a large buttock mass. I don’t get grossed out much but this was a large sebaceous cyst that was about 3 inches in diameter hanging off the left cheek and during its removal it started to leak and then a lava flow ensued and it just kept coming and coming. I’ve never seen such a large cyst before. He was very stoic as he laid on his tummy on a hard church pew bench and it though it hurt a few times he was a great patient. I thought he would be mad at me for hurting him but I was in for a big surprise. He was so grateful that about a half an hour later he returned to give me a man purse as a gift. It’s always a nice feeling to get a gift deserved or not. I accepted it with gratitude, as I didn’t want to hurt his feelings by not accepting it. We don’t serve for accolades, payment, or barter and we really don’t expect much in the way of thanks. The people that we treat are so grateful for whatever treatment that they receive. The people here are polite, patient, gracious, and generous. I am humbled by their attitudes and get great satisfaction when I think I improved their quality of life. These people here are hard working individuals and it is amazing how fit and strong they are even when they are 70 years old. I admire their stamina and work ethic to continue to be productive all their life. I want to wish a happy birthday to my precious daughter Allison. I’m sorry that I couldn’t be there to celebrate your birthday but will make it up when I return. And to my lovely sister Daphne, I wish you a very happy birthday and for strength and good health in the months to come. Yesterday was a travel day as we left the Isuta village the way we came. 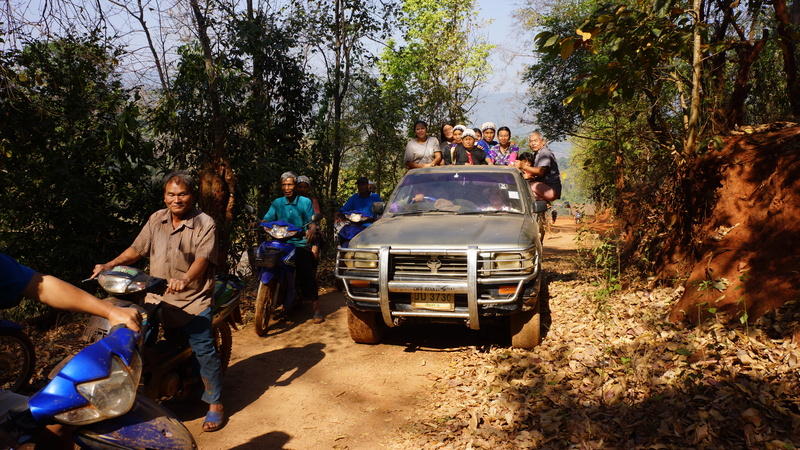 The villagers were great in taking all of our supplies and luggage down the steep hill. Men, women, and children helped us down as well to the long-tail boats. It was a sad good-bye since we made many friends and shared our experiences and culture with one another. They were appreciative of our presence and efforts and we were appreciative of their hospitality and accommodations. 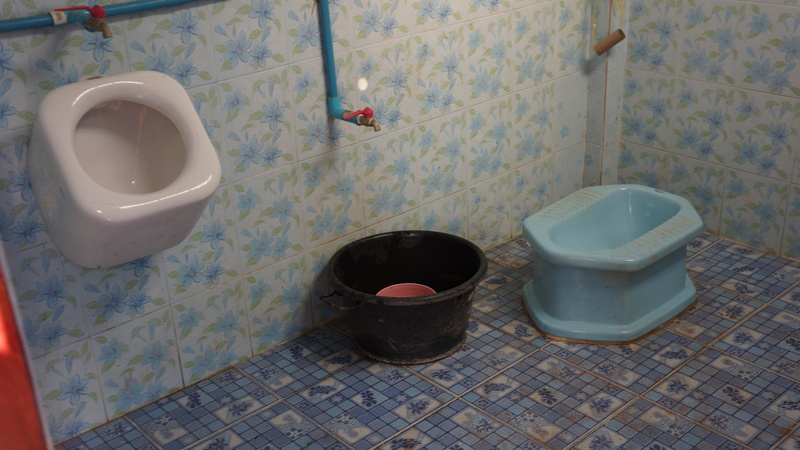 They had even built two toilet stalls for us. 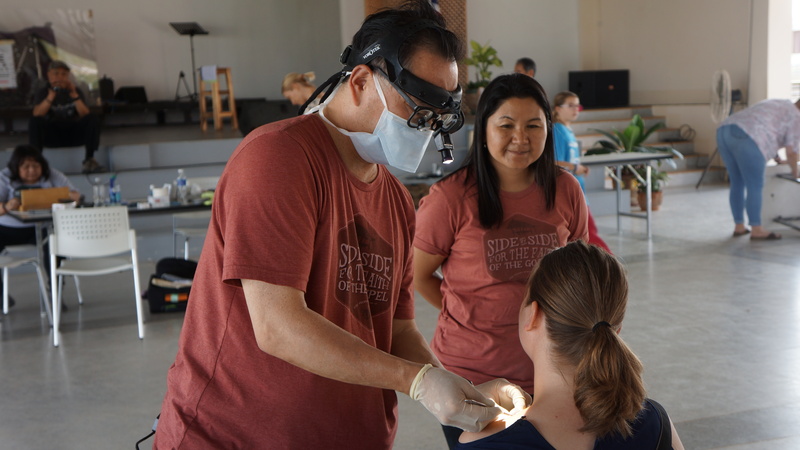 The dental team did a great job in education and prevention of tooth decay, which goes along ways for the children’s future since so many past mission trips were spent pulling rotten teeth and treating abscesses. Plus each child received their own toothbrushes and instruction on how to properly use it and how to protect their teeth. 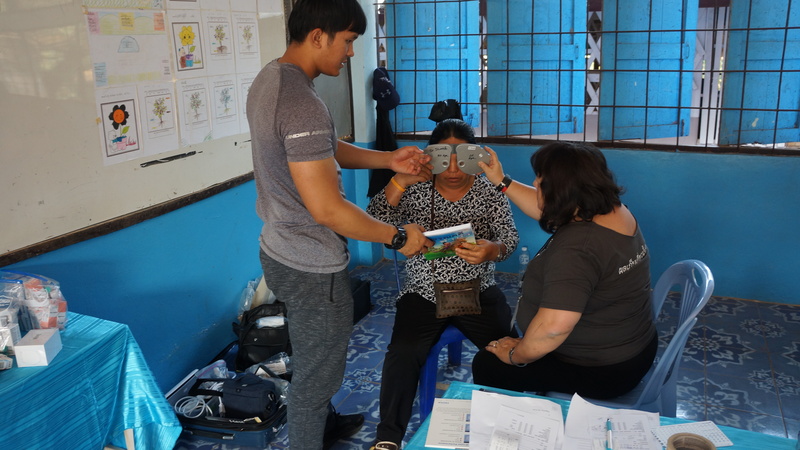 The optometrists saw many eye patients and although some patients had cataracts already, they were given sunglasses to prevent further damage while others will get their glasses at a later time. 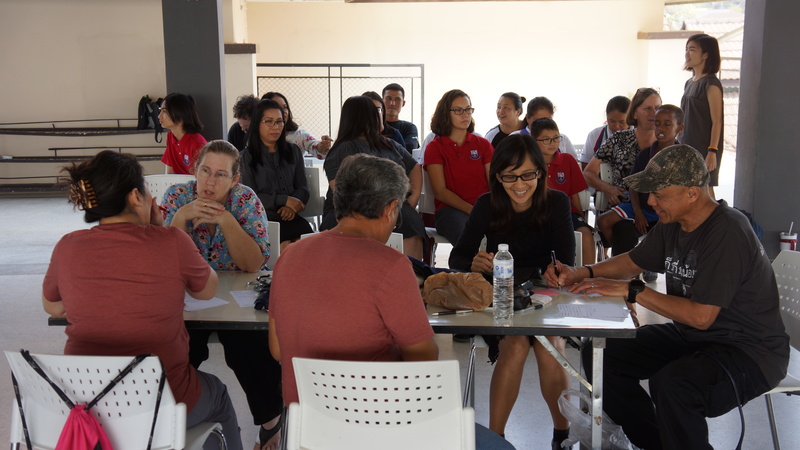 The medical team taught prevention, strengthening, and ergonomic techniques for musculoskeletal disorders, and treated ailments such as respiratory illness, GI issues including worms, rashes and skin conditions such as scabies and fungal infections. There was also time for monkeying around, fishing swimming, and for many, enjoying the camping experience. Now it was time to return to Chiang Mai. I said I didn’t want to whine anymore so I want to have a positive attitude this trip and here is one exhilarating experiences I would like to share. It was a real treat to be in a car driven by a race car driver disguised as a pastor. So it was a really, really, exciting to experience a life threatening and harrowing ride back through the river crossing and back roads along the streams holding on to dear life to the ceiling strap straining my left shoulder in the meantime. Hey, but pain builds character and my frozen shoulder with limited range of motion will keep me from offending others with my body odor . Bring it! Where can you get that adrenaline rush? WOWEEE! A Disneyland E-ticket would never come as close to this death-defying ride and a ride would have to be a Space Mountain, Star Tours, and Big Thunder rolled into one just to get close. For those who enjoy a good scare, you really missed out something. It was so cool to breeze by 5 cars at a time along blind S-curves crossing over the medium like a sports car in Le Mans. (I would have to get a Porsche turbo to do that and I still wouldn’t be as fast.) I found out was it was like to travel with Godspeed in a truck with no seat belts. It’s okay because Pastor K, as he likes to be called, has an angel as his wing man. The only thing we could have done to make it more exciting if we were to raise are hands up and scream. When Pastor K goes, “My God!” as he breezes by a scooter, it adds to the excitement and anticipation to the next curve. I found out that 140 kph is about 84 mph and you know how fast we went? Well, we were the lead car and we had time to stop at his church along the way so he could change his shirt, we could have a banana, meet his wife, go to the bathroom, and take some photos, and we still ended up the first to arrive at the hotel. I am grateful for the two medications I took for the motion sickness, so PTL! No need to get that Tesla P100D with ludicrous mode now. Been there, done that, too. We all made it alive back to Eden Hotel with no casualties (I’m just a worry wart) for an overnight stay and packed up to travel to AYDC tomorrow to our old stomping grounds. I guess he likes his nickname Pastor K because we were going “Oh K!” the whole time. A few setbacks have occurred. A few team members have been under the weather with respiratory illnesses or GI upset and need some rest. 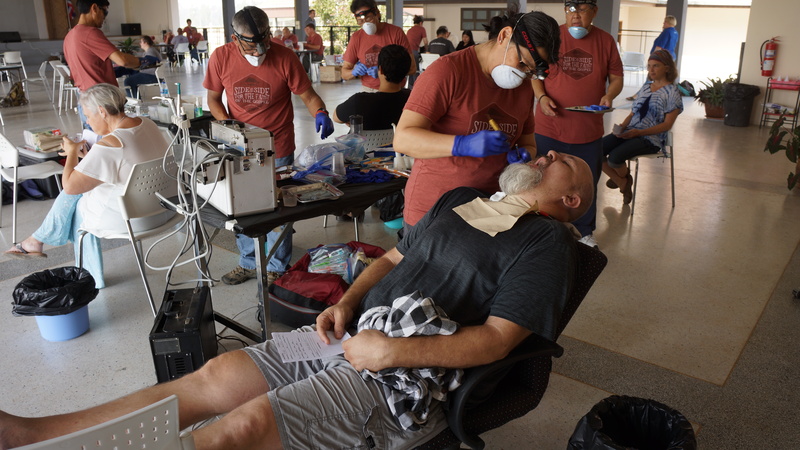 Some individuals started the trip with lingering illnesses and aches and pains and are digging deep to contribute so we lift up the team to God for healing and would appreciate your prayers. We were also told this morning that our bins at the Chiang Mai airport have not been release and may not be until next week due to the weekend. Yes, bummer. But we will adapt and not think “what if?” and optimize the situation since that is all that we can do. We will use whatever gifts and talents God has blessed us with and see what He is planning to do with us. I know that I am personally learning how to have a positive attitude adjustment. God has taught us patience with this trip and when growing impatient and becoming frustrated, based on our own desires and not His, He teaches us more patience and humility. Sure, I’m a surgeon as is Leo and we like to “cut to cure”. 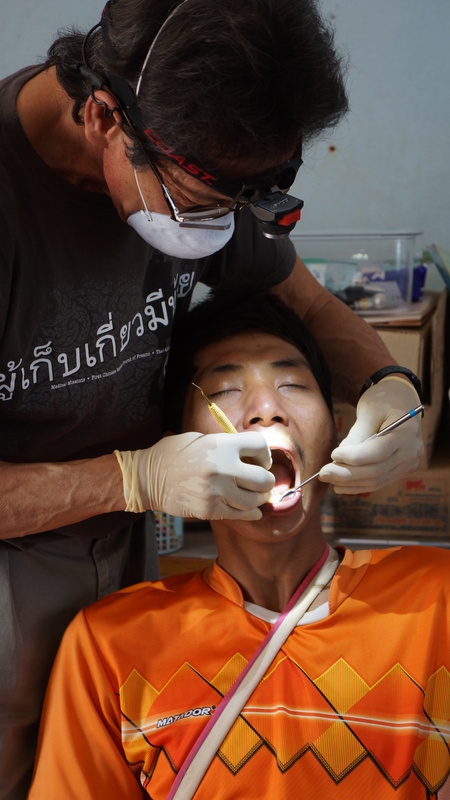 The dentists are surgeons as well and they salivate at performing procedures. 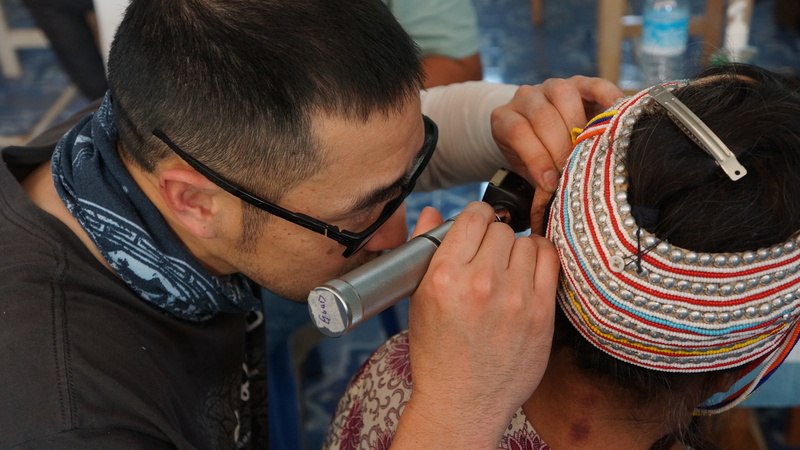 The optometrists have skill to correct and optimize one of our most important senses. Society has placed these acquired skills at a respectable level though we are not better than our neighbor and fortunately for us, God didn’t limit us with only those skills. Mark 12:31…”You shall love your neighbor as yourself. 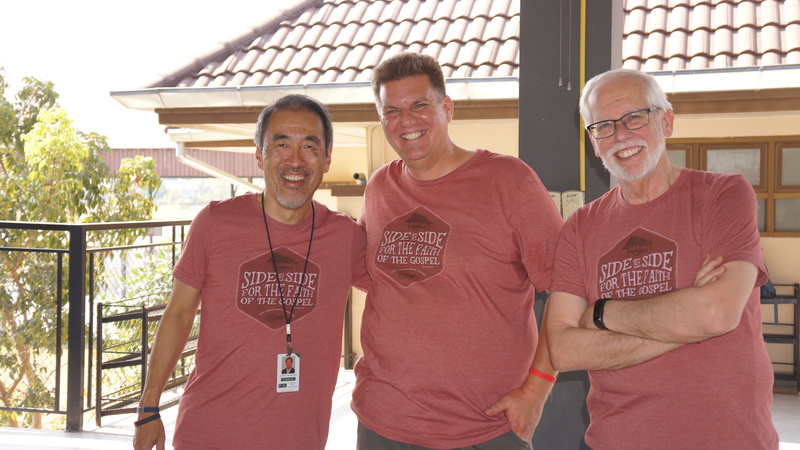 There is no other commandment greater than these.” Our very presence here on the other side of the world is what makes this mission trip successful more than what we do or what we think we should be doing. God will use us as He desires and for His glory. Today it was an easy three-hour drive to Chiang Rai in nice air-conditioned limo vans. 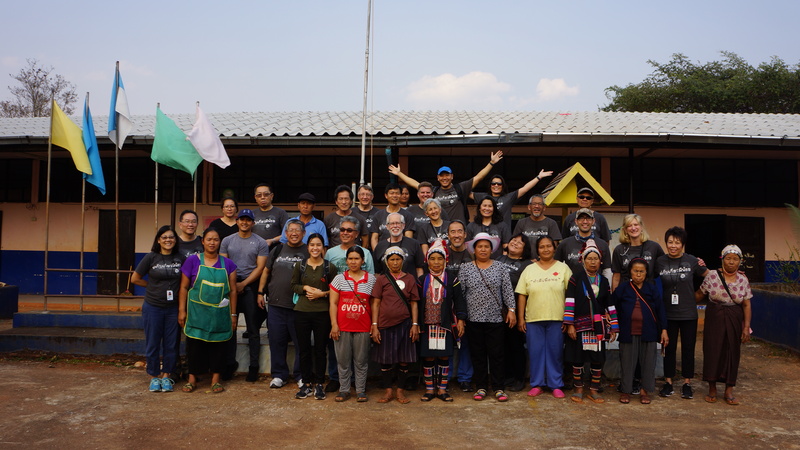 We arrived at the AYDC-TAMF (Akha Youth Development Center of Thai-Akha Ministries Foundation) and were immediately greeted by old friends that we have missed for many years. It was great to see Luka’a wife and children Ghan, Lin, Da, Wee, and Wan along with their friends and relatives again. Ghan made us a wonderful lunch and we had a nice visit in their home. We raided the storage are at the guest house and, although it was not quite a gold mine, we were brought to joy and excitement to find some old medical supplies and drugs that were left from prior missions so that we could do a few minor surgical procedures, give steroid injections, and replenished the pharmacy. YIPPEE! With these supplies, we were able to broaden our treatments as we treated staff and children from AYDC compound. We were able to see some of the new buildings since the large 6.5ish earthquake in 2014 that rocked the buildings requiring major demolition and reconstruction. 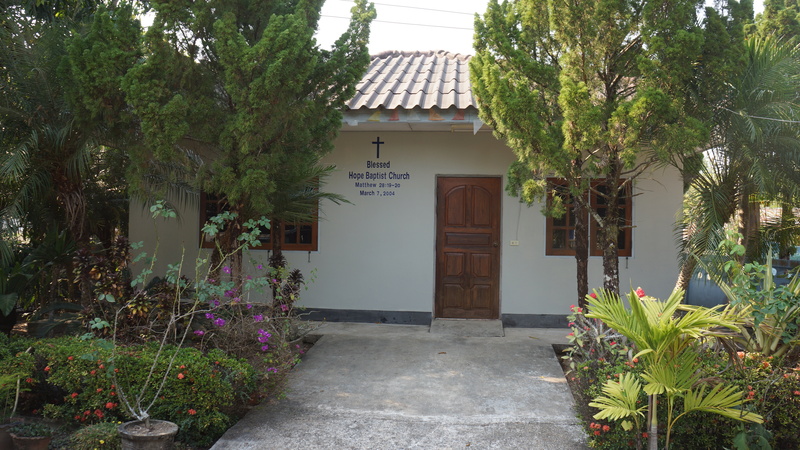 FCBC helped the rebuilding by sending funds to help repair the church sanctuary, girls and boys dormitories, and homes). The tea crop on the compound is flourishing as they are harvested to sell and raise funds to sustain AYDC. The new bus that FCBC donated years ago to replace a dilapidated old school bus was seen in action. 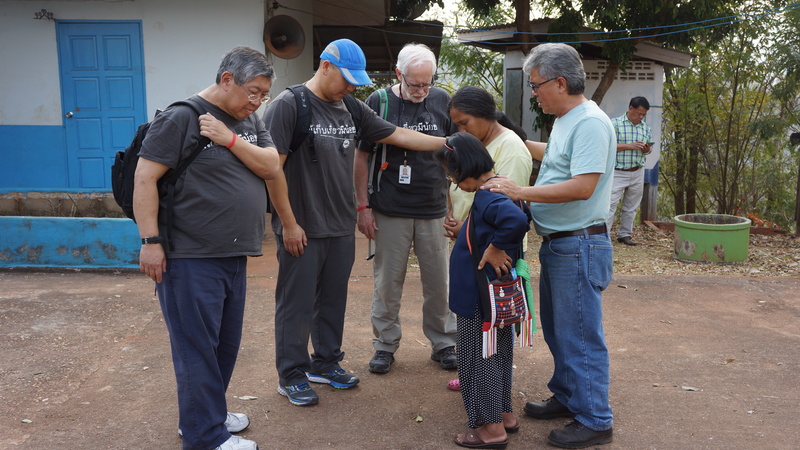 We will always hold a special bond with these people of Thailand, as they are our sisters and brothers in Christ with whom we continue to bond no matter what the distance. 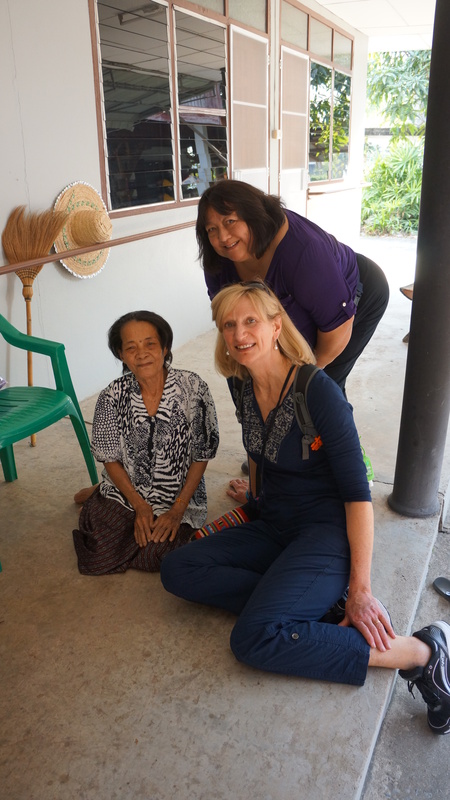 We look forward to the next week working side by side once again in Chiang Rai. 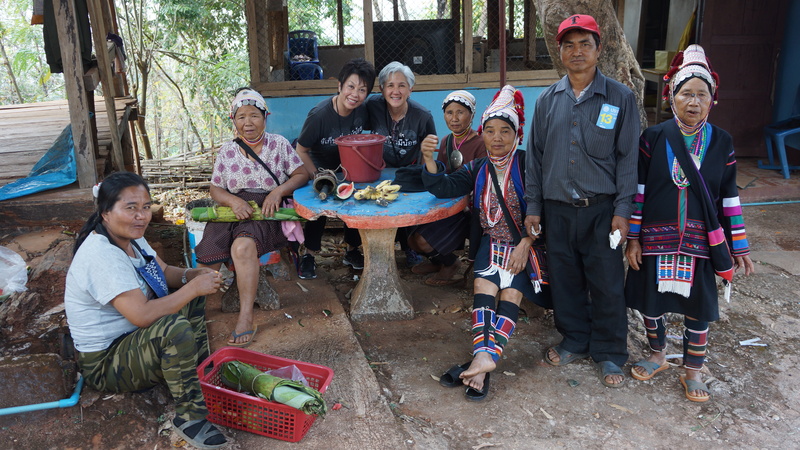 Ape, Luka’s mother is the matriarch of this Akha village. She remembers you face no matter how much time has elapsed and she passed out bracelets to many of the team members and even gave a lucky bystander photographer a dongle for his camera. It’s Saturday so you know what that means…night market and bazzaar shopping spree! There is a reason why I didn’t take up camping. I am starting this blog in the middle of the night, as I don’t have much enthusiasm right now so I guess I need to vent. I have tossed and turned every night and this is no exception. I can’t sleep within my claustrophobic mummy bag as I try to center myself over a sweet spot on the mattress pad but roll to the side where my half my body is on the floor while the other rests on air. My necks has a crick in it (not sure if that’s a true medical term) and the bare skin areas stick to each other due to the humidity and sweat. I don’t think I’m the only one uncomfortable here but we are supposed to go to sleep and wake up refreshed, not waking up with aches and pains and headaches from sleeping the wrong way. My bladder is full and pulsating but it’s too cold out there to make a potty run so I find my down jacket to keep me warm and my head covered to maintain body heat. I wish I had a urinal or a Depends. There is minimal wiggle room in these mosquito nets but we all hope we won’t contract malaria or the Zika virus or Japanese encephalitis (shoot, I forgot to get that vaccine shot). We have layers of Deet on our skin and our clothes and it burns at times. It’s a little uncomfortable to type laying on my back, neck bent up with two pillows since I can’t sit up, the computer on my tummy digging into my ribs with knees bent to support and bend the screen at the right angle (hah! That’s why they call it laptop!) There is nothing else to do at this hour so that’s why I decided to type. Bill assigns me this chore each year to keep me preoccupied and to stay out of trouble but I do this to let you know we are not captured and held hostage or we drove off the cliff. Moving my limbs keeps me warm since I can’t do jumping jacks. I can’t get up or I’ll wake my other 8 other roommates, though they probably have earplugs in since we all “saw the logs” at night. I’m even looking forward to the Cup-O-noodle and powdered coffee and our breakfast that the villagers prep for us each am. We should appreciate that since they have to get up earlier than us to prepare our food, which has been very good and plentiful. I can’t wait to sleep in a bed tonight like you guys. Boo hoo. Thanks Naomi Ruth for those care packages; they are very valuable as snacks at 3 am. 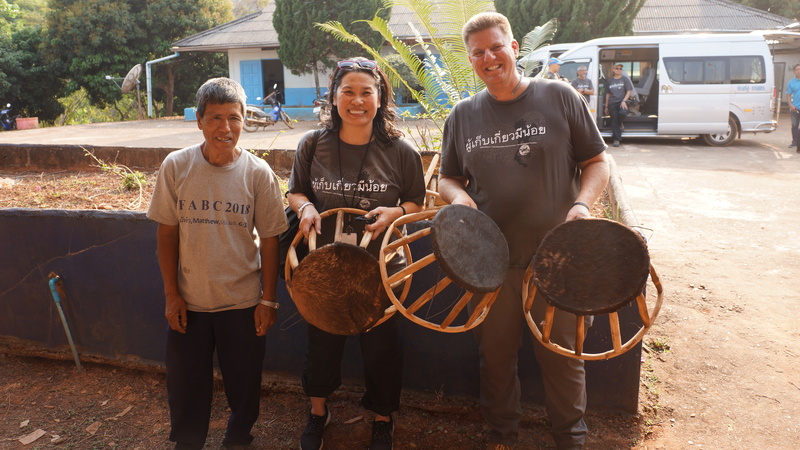 The day and a half trip to get here, in and out of airports, squeezing in vehicles like sardines, or bouncing in the back of a truck from place to place, facing often hazardous road conditions, encountering hostile environments and risky travel is what is involved in these mission trips. The weather is too hot or too cold and too humid. The water has bugs that we are not used to so we take probiotics, Pepto Bismol, antibiotics, boil, disinfect or filter our water to drink to prevent traveler’s diarrhea. Some of us took typhoid vaccines along with several others (hepatitis A and B, tetanus). Our showers are cold and from river water, yet it is blessing to have them. Thank you Bill. Our compound has armed guards so we smile a lot as we interact with the military personnel who are carrying side arms and AR-15 rifles. Even getting to the destinations, the team needs trucks traveled along treacherous highways and had to cross streams balancing on rocks or wading through the water, carrying supplies on their backs under the hot sun for miles. We have to go back the way we came so that means back in the 4 x 4’s, along the potholes and dirt roads. Good thing it’s not raining otherwise I doubt we could have made it or we would have gone off the many cliffs since were riding the crest of the mountain range for 2-3 hours. Fortunately we haven’t broken down. At least I am up early enough to put on my motion sickness patch behind my ear and take an anti nausea pill for the bumpy ride back to Chiang Mai. I know you’re saying, “Quit whining!” There I said it for you. I’m just venting, as I like to complain sometimes. I’m not asking for sympathy because we all signed up for this. And, you know, we will gladly sign up again! This is about serving the Lord in what capacity you feel that you can based on the gifts and talents that each of us have. There are many bodies in a church and many Christians in our community, yet few are willing to serve. We live a very comfortable life and as Pastor Jack says we have to get off of our blessed assurance to do something significant for the glory of God, at least for believers. Every few years are okay for me to get out of my own comfort zone. As a health care practitioner, I mainly see patients that want to have a procedure and do not necessarily need them. My patients generally can afford what ever they want and pay cash. 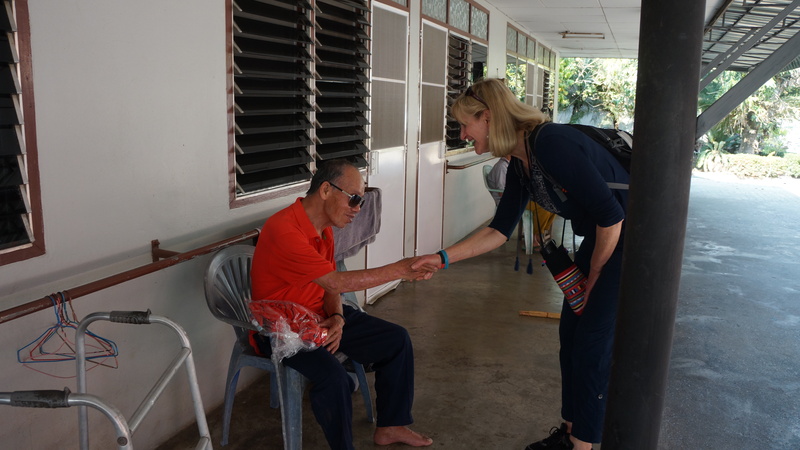 Others on the team may treat those in need at home, but for me I participate the best that I can to try to help people who need our services that don’t have access to health care services. This is truly out of my comfort zone as I treat patients of all ages, see exotic diseases not seen before, and dig deep in knowledge and experience while performing some procedures that I never even did before. Even then with the correct diagnosis, we are frustrated with the lack of medications, surgical arena to perform surgery, and lack the follow-up care that they also would need. I am sure that we are here for a reason, though it is not always clear to me and it becomes apparent later. I want to be as effective a physician and fellow human being (I’ve never really liked that term because were all human). The dentists and hygienists are great. 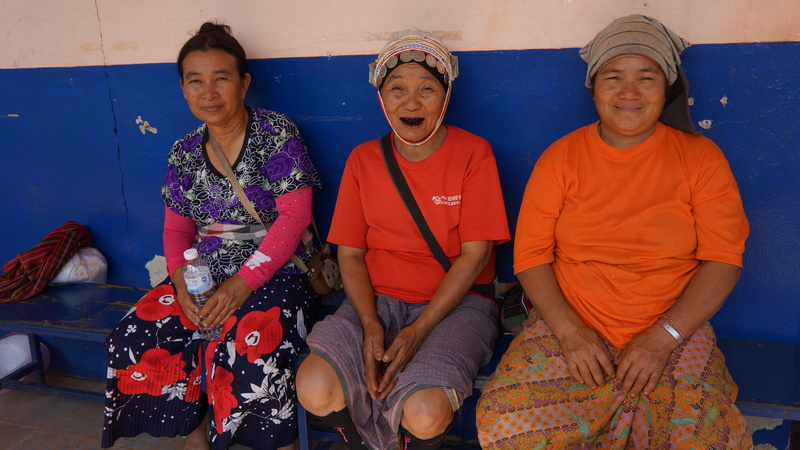 They relieve pain and suffering and prevent future dental decay by providing education on hygiene. They even distribute toothbrushes to those that are receiving them for the first time. Kudos to the optometrist who literally can make a blind man see. The medical doctors and nurse practitioners apply their craft with care, touch, and appropriate medications. As a surgeon, I need to cut to cure. Once we get the tools of our trades back we look forward to making a bigger impact. Sometimes we don’t get off of our blessed assurance because we don’t know what our gifts or talents are or that we’re afraid that we are inadequate or fearful that we will be in a uncomfortable situation. And yes I know that it has been said that fear can lead to the Dark side. Fear leads to anger. Anger leads to hate. Hate leads to suffering…Yoda. Well 1 Corinthians 10:13 God is faithful, and he will not let you be tempted beyond your ability (i.e. God won’t give you something that you can’t handle.) See, isn’t this funny? Did you see what just happened! God is talking to me right now through this blog. How ironic. He woke me up in the middle of the night to knock me in the head with this message. He’s pretty sneaky. He sent me on this trip to give me this personal message. God is asking each one of us to get out of our comfort zone for His glory. That might even mean asking your neighbor sitting next to you on a train if they know the Lord, volunteering at Matthew 25 at FCBC, feeding the poor at the Poverello House, getting involved at church. God needs you to step it up and quit whining about yourself, your friends, your job, and, yes, your church, FCBC. The roosters are crowing, people are waking up and walking the grounds. It’s time to get up for another day. I have renewed enthusiasm, so I need to finish this so I can get the day started. I can’t wait to stretch out, to shave, and use drinking water to clean my face and brush my teeth and groom my hair. We need to pack our bags and head to Chiang Mai for an overnight stay and then we will be going to Chiang Rai. 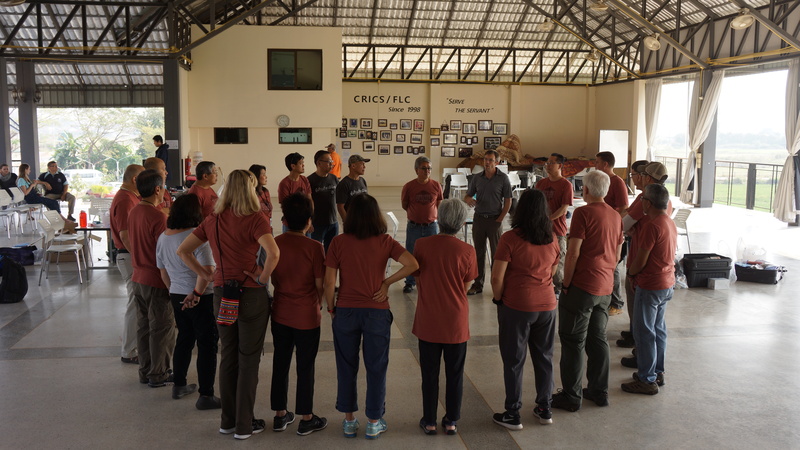 Our planned visits will be at AYDC (Akha Youth Development Center and Luka Chermue’s home base), a prison, a health clinic, and a school established by Baptist missionaries last century. I am excited for this leg of our journey. Been there, done that so it should be smooth sailing once we all get our tools back. Bring it on! I hope that each of you will venture off and optimize your gifts and talents and may the glory be to God.